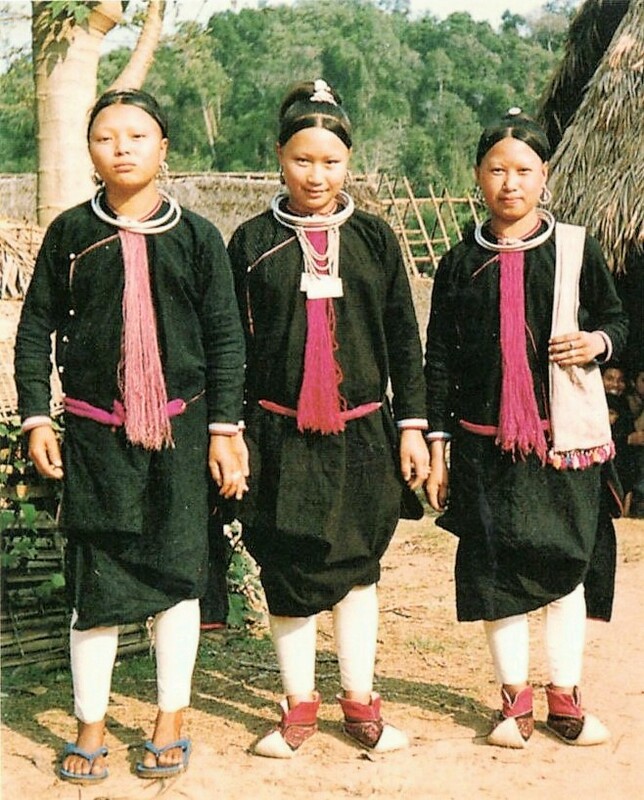 Today I will start talking about the second major branch of this language family, the Yao or Mienic peoples. 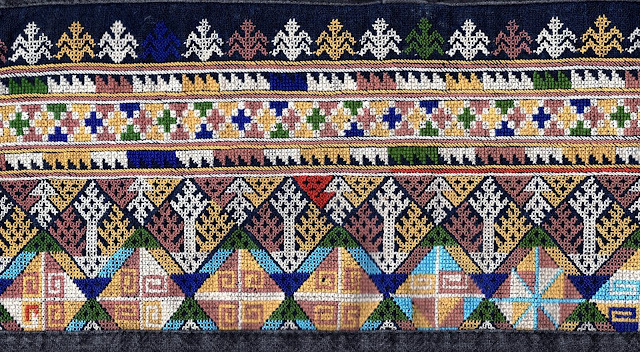 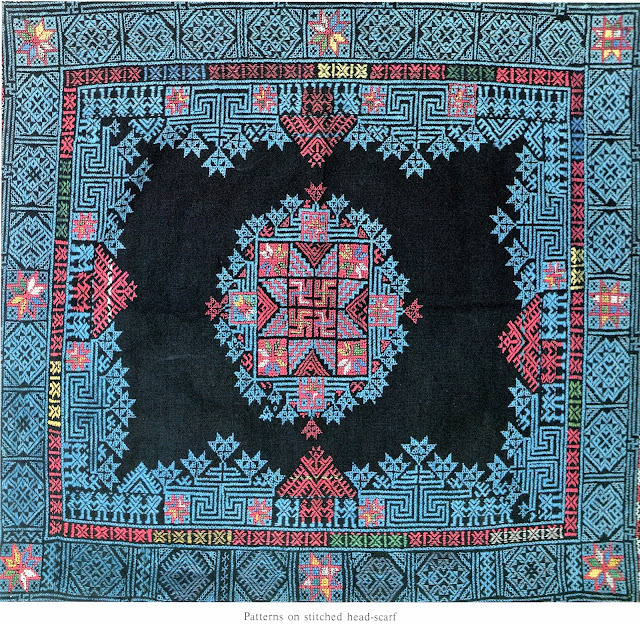 The image above is a closeup of a piece of Yao embroidery from Thailand in my personal collection. For a long time I had no idea exactly where it came from. 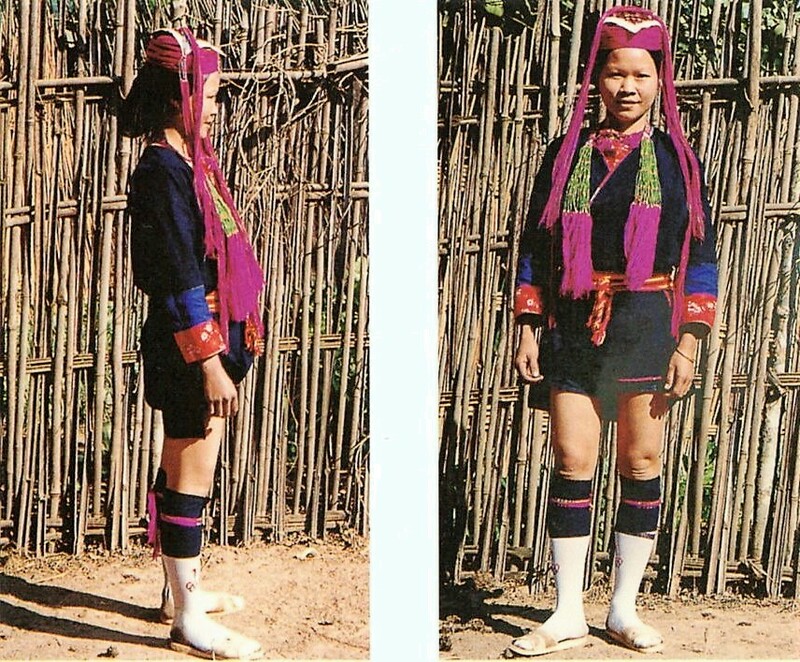 I finally discovered that it is part of a pair of pants for a Iu Mien woman from the Fang area of Chang Mai province of Thailand. Here is an image of a complete pair of pants from that area. 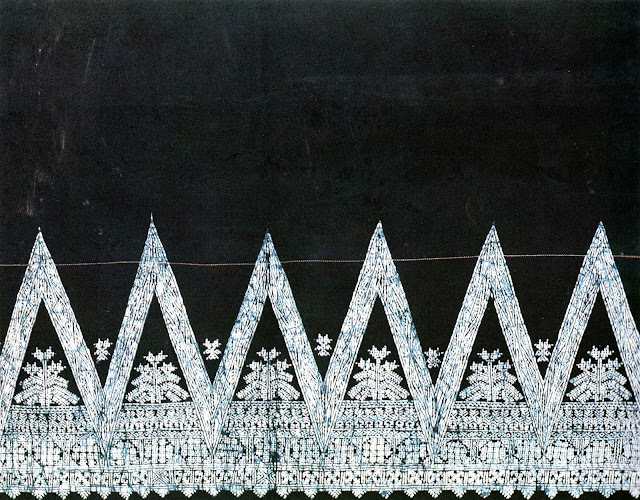 My piece of embroidery would have been the top edge. 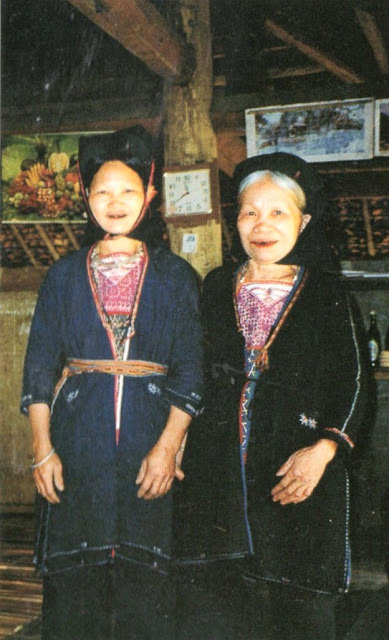 This is the second major branch of the Hmongic/Mienic or Miao/Yao language family. 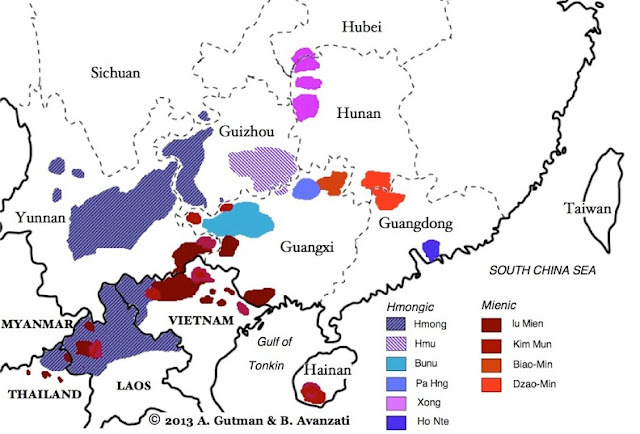 Here is a rough map of the locations of some of the languages of this family. 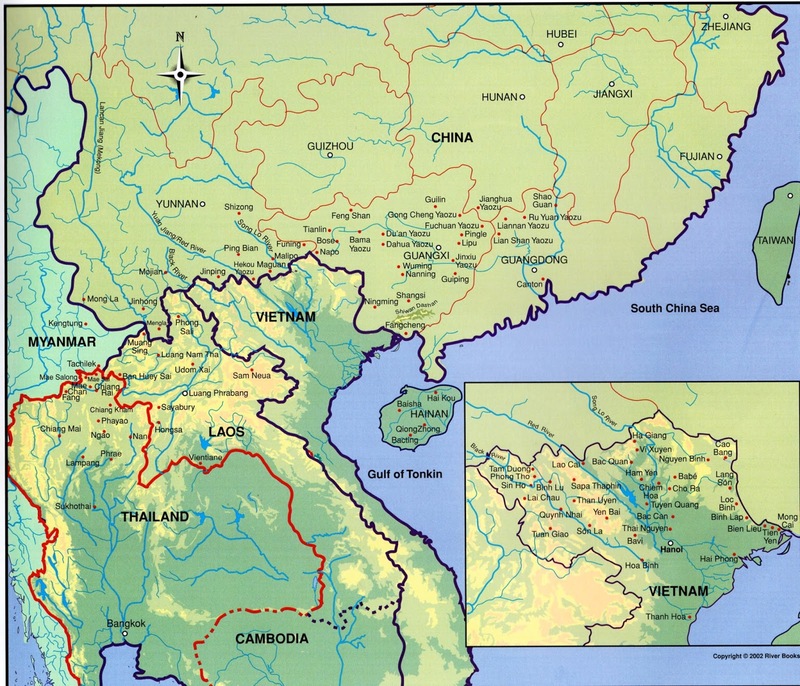 Please refer to this map throughout the article. Some would argue that the term 'Yao' be dispensed with, to be replaced by 'Mien', but in fact, 'Mien' is the self designation of only one branch of this group. 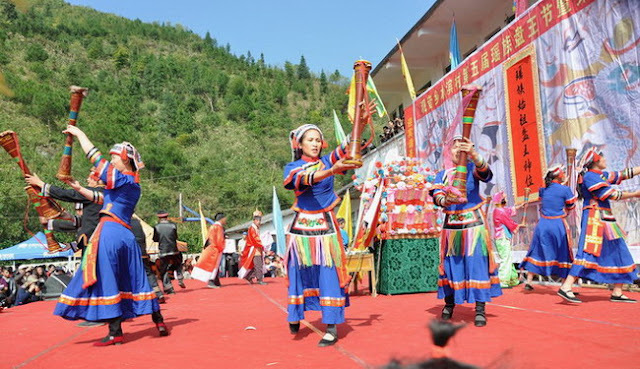 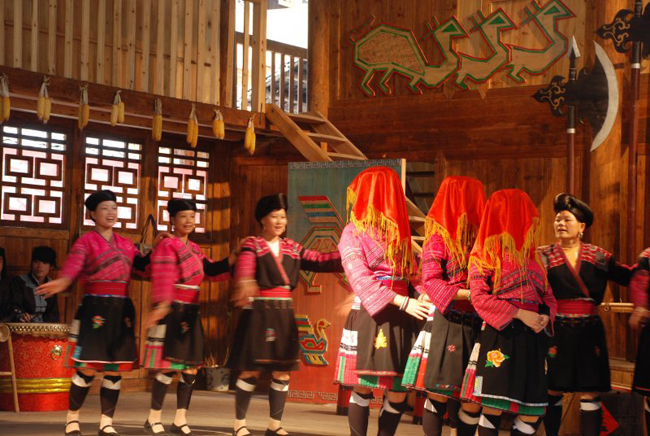 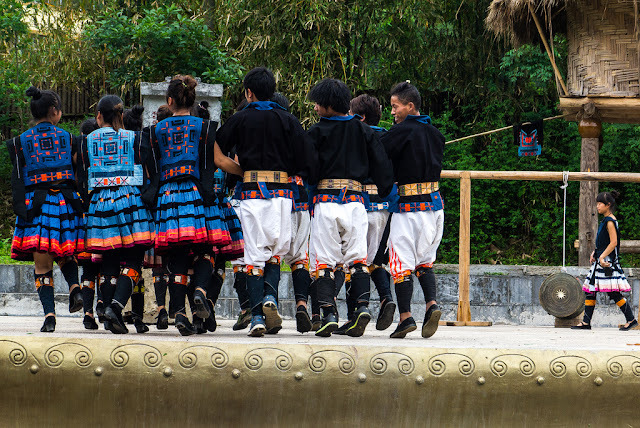 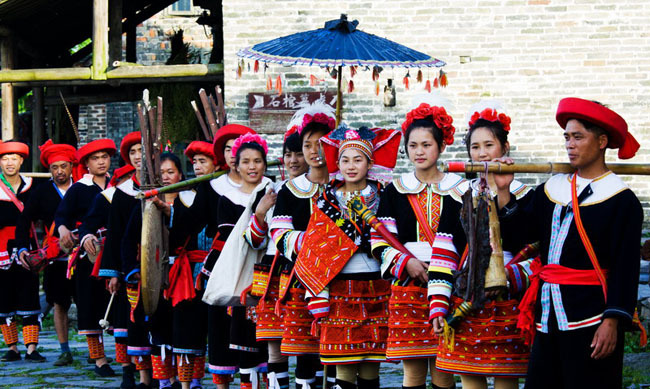 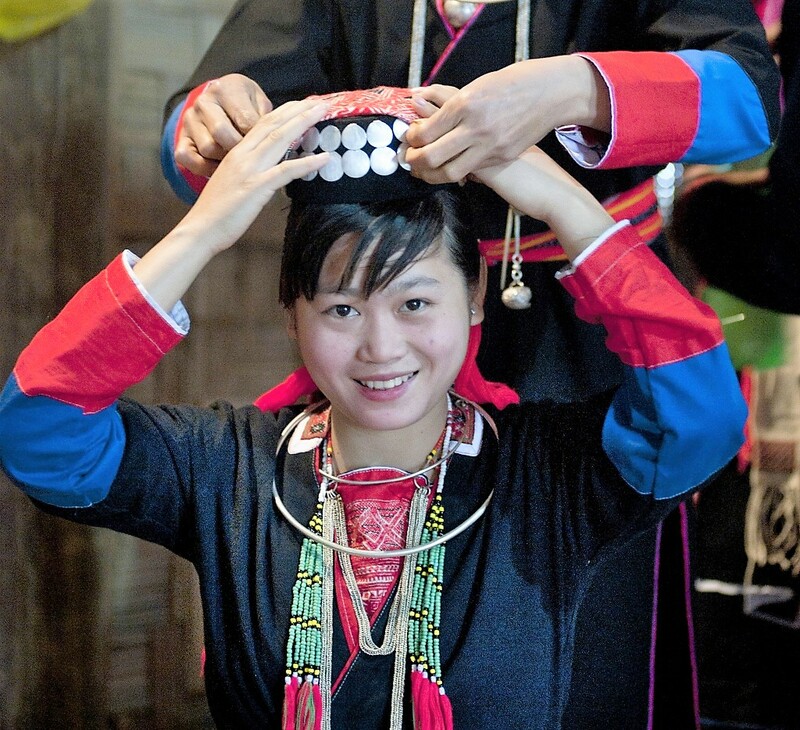 The different Yao peoples, like the Miao, have been given various names by their neighbors, which can be confusing and misleading. 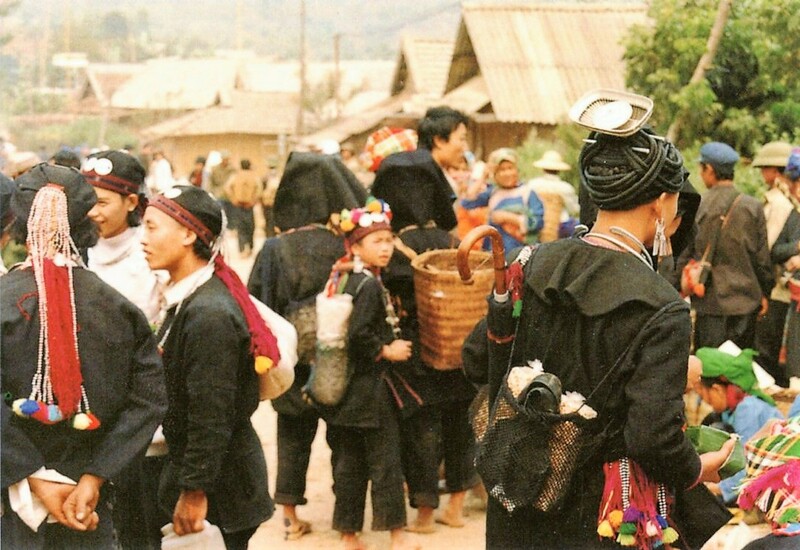 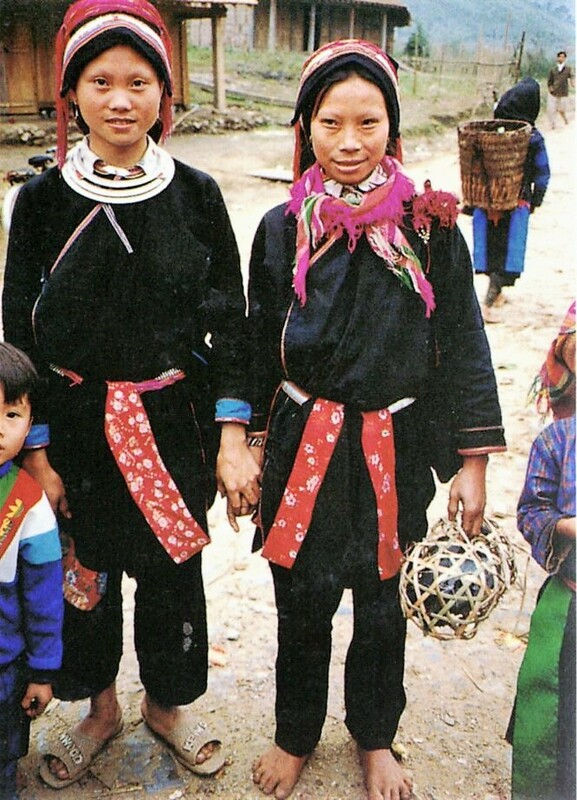 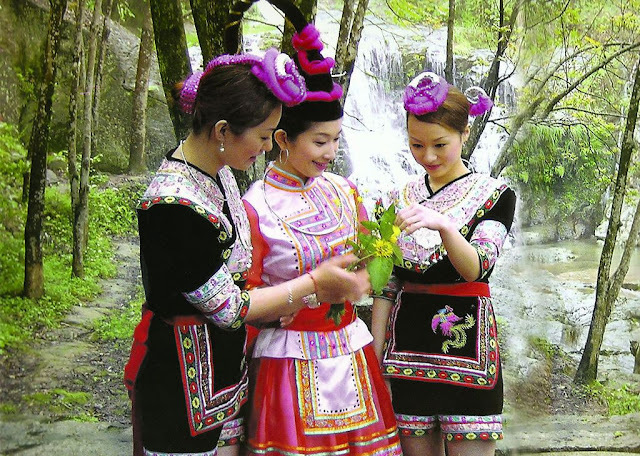 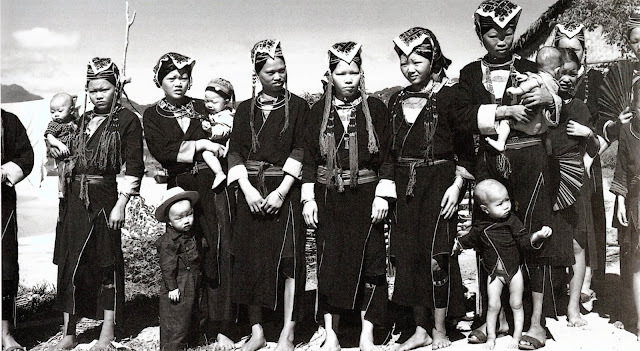 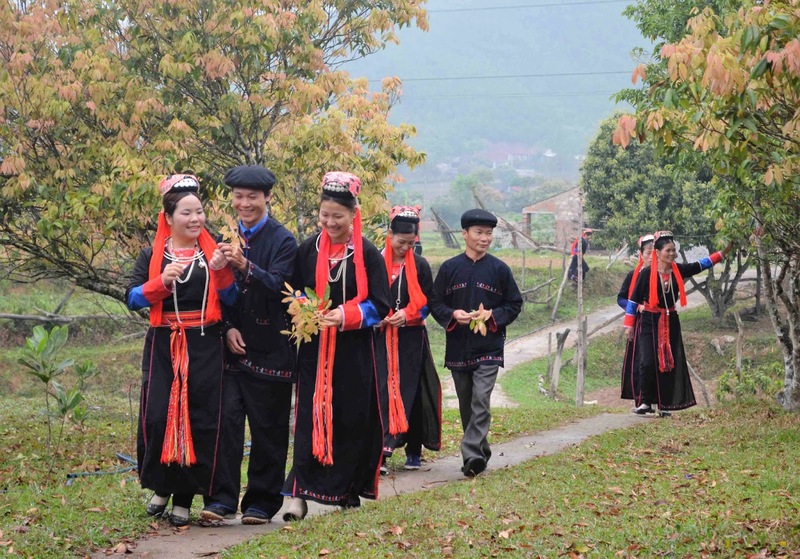 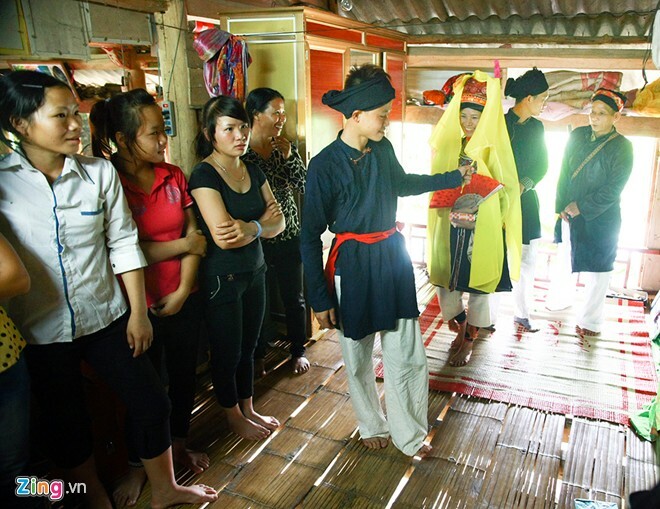 One case in point, the 'White Trousered Yao', which I read about in one source, part of the Kim Meun group, found in northern Vietnam, whose women, unusually, wear white pants as part of their dress attire. Then I read more about them in other sources, and the information did not jibe. 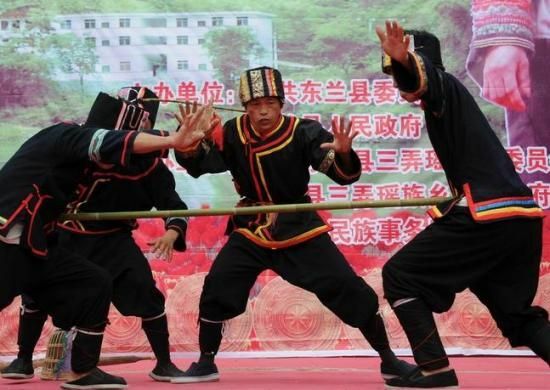 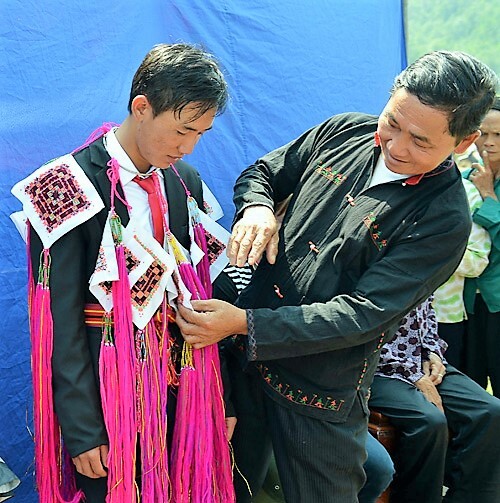 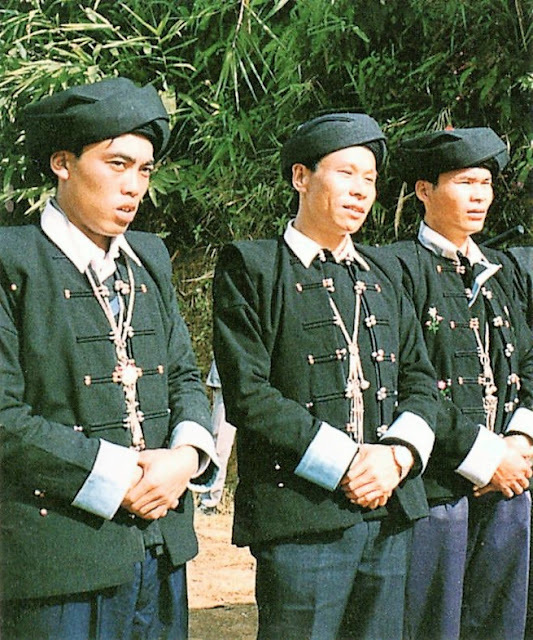 Eventually I figured out that there is a second group called the "White Trousered Yao' who speak Bunu, live in Libo county, Guizhou province in China, and whose men wear white pants as part of their costume. 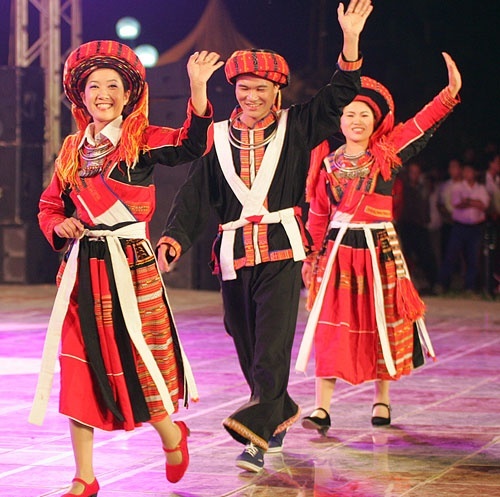 Moving roughly from East to West, and like the previous articles, this one will not present all the different groups. 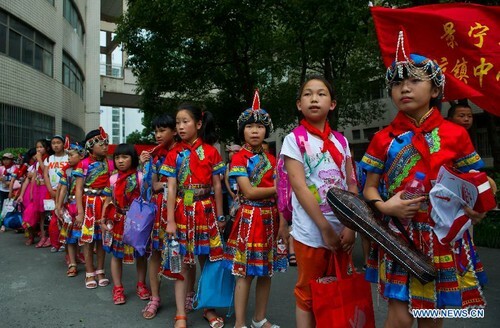 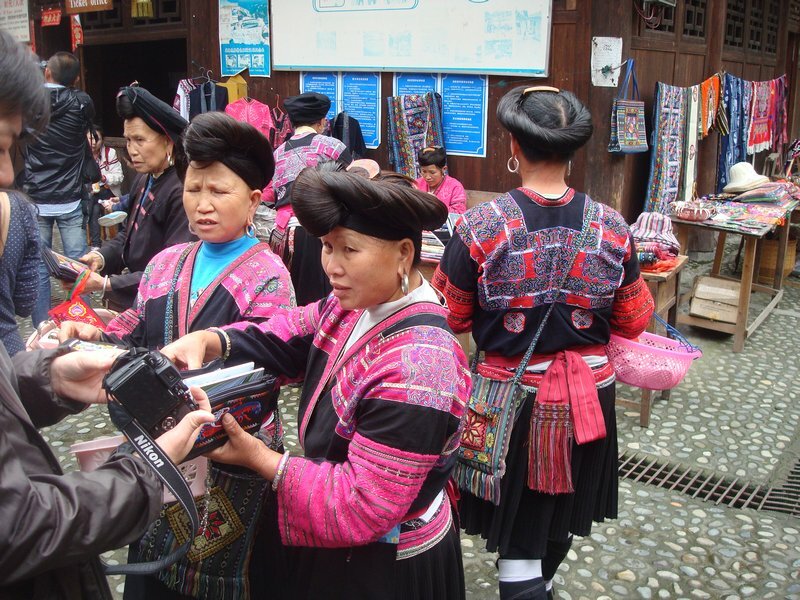 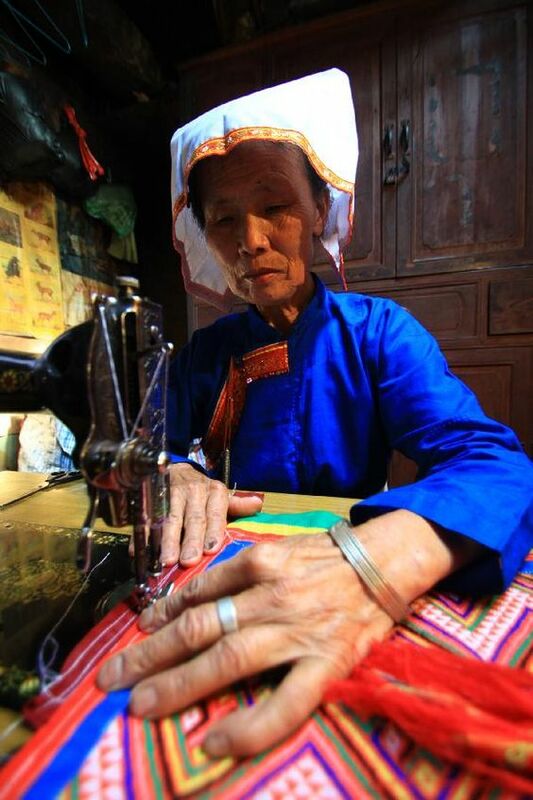 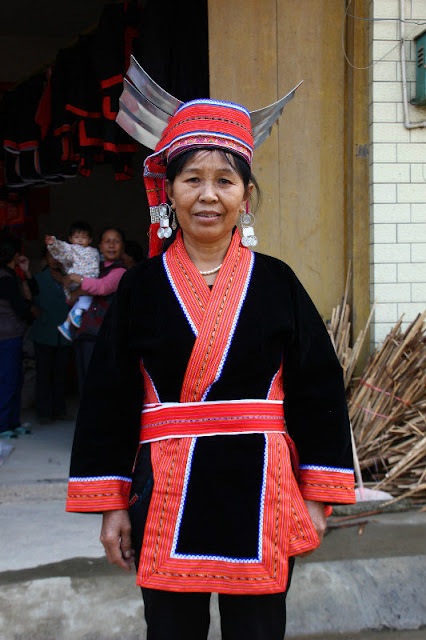 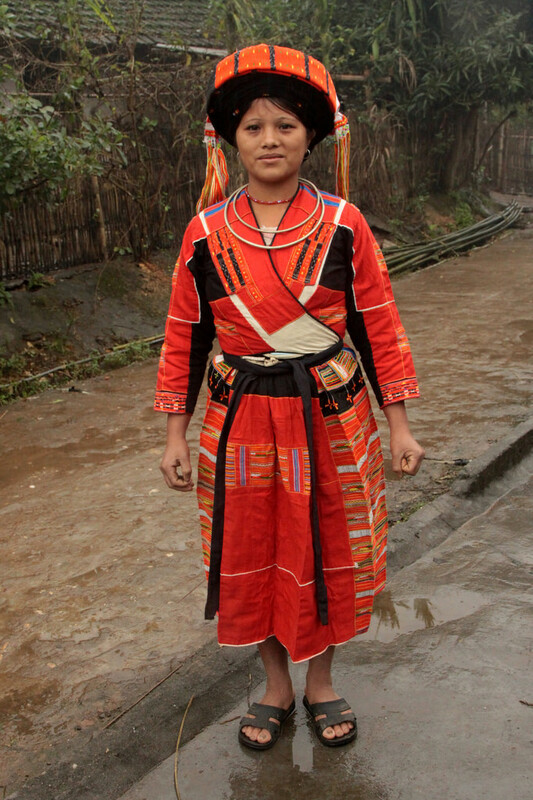 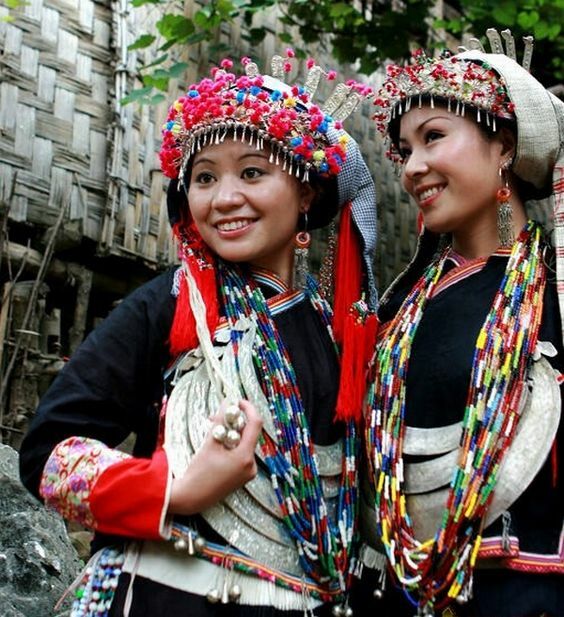 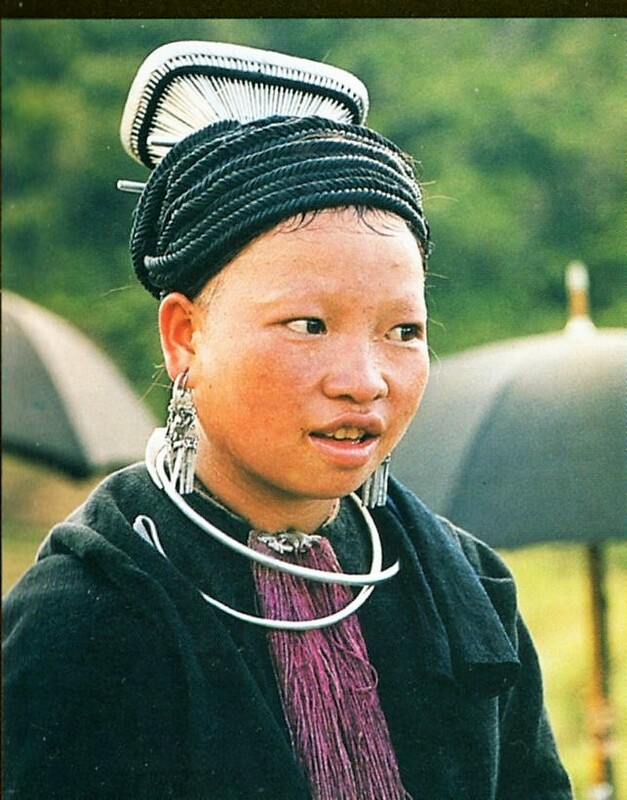 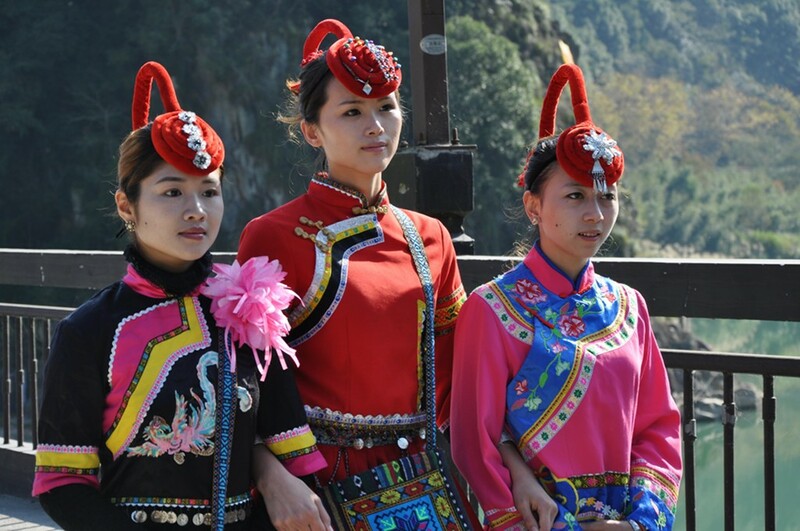 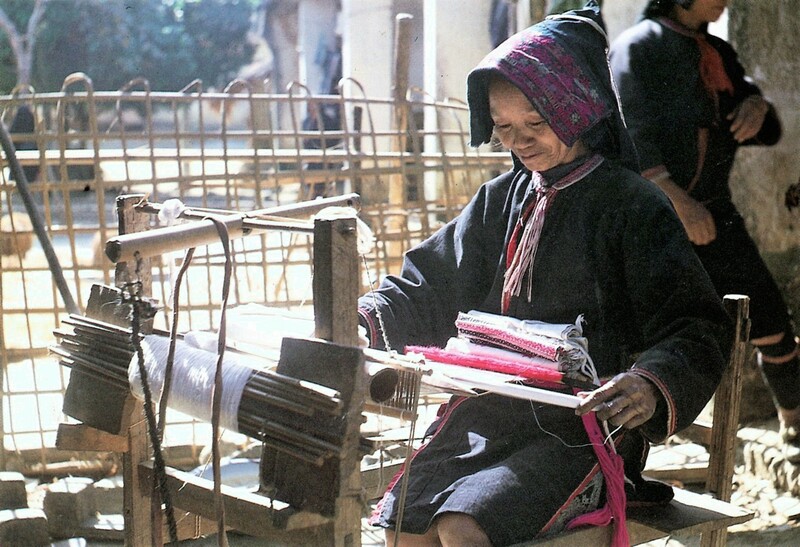 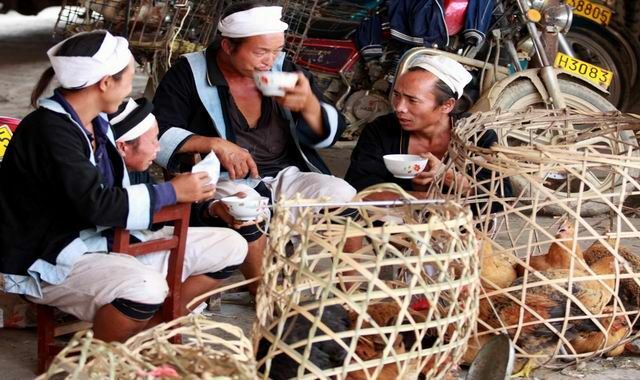 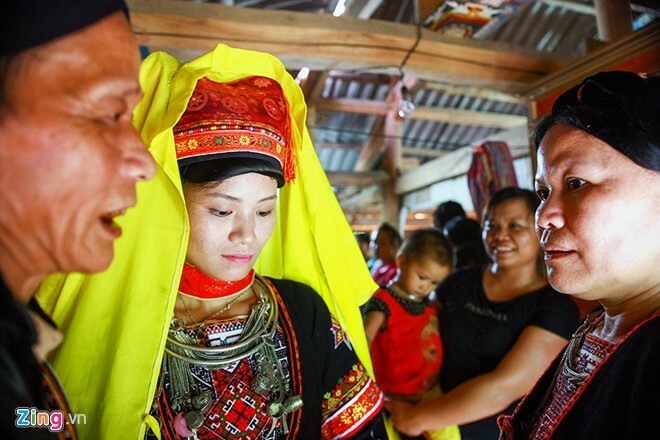 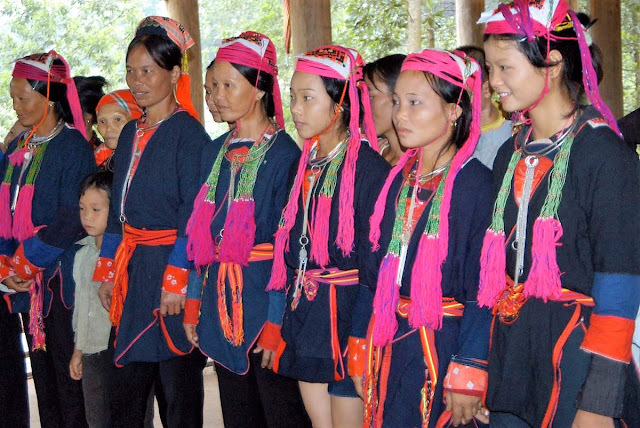 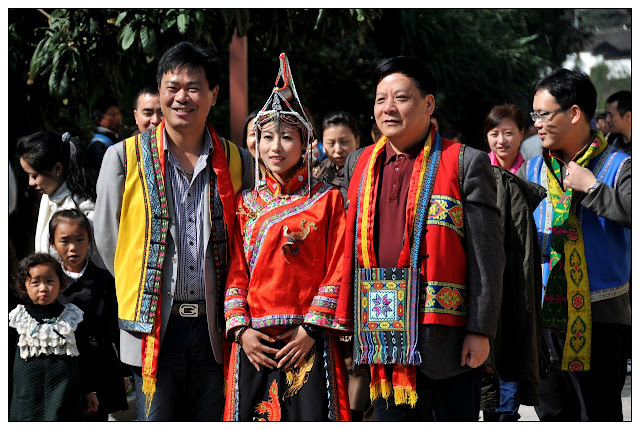 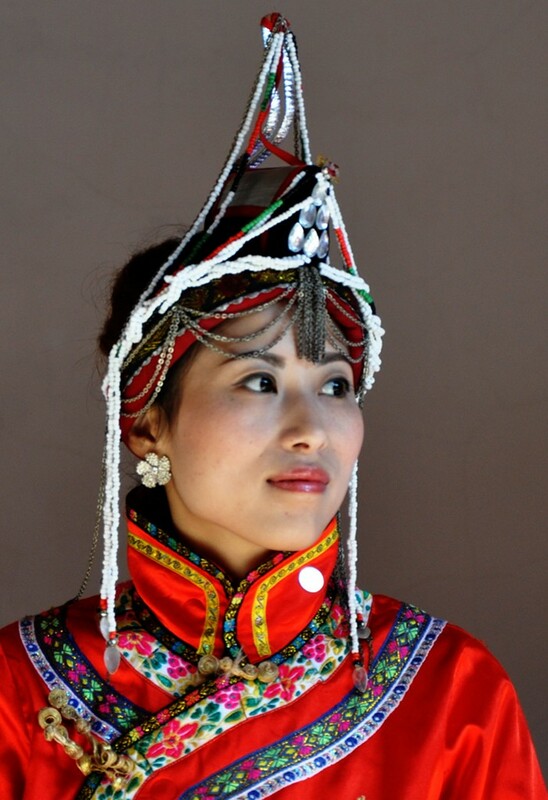 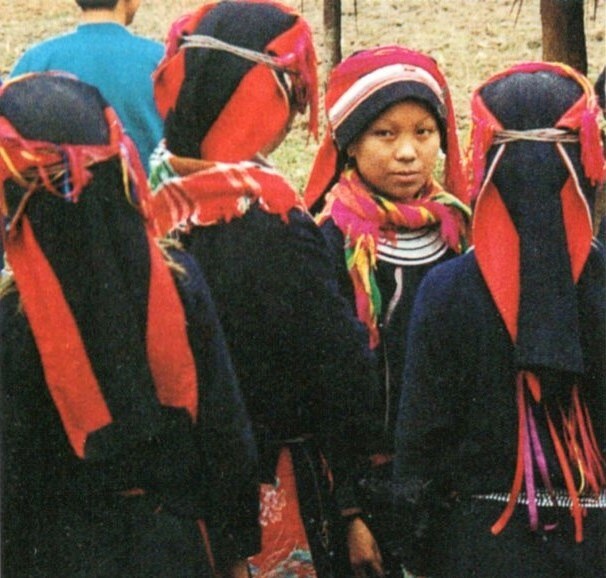 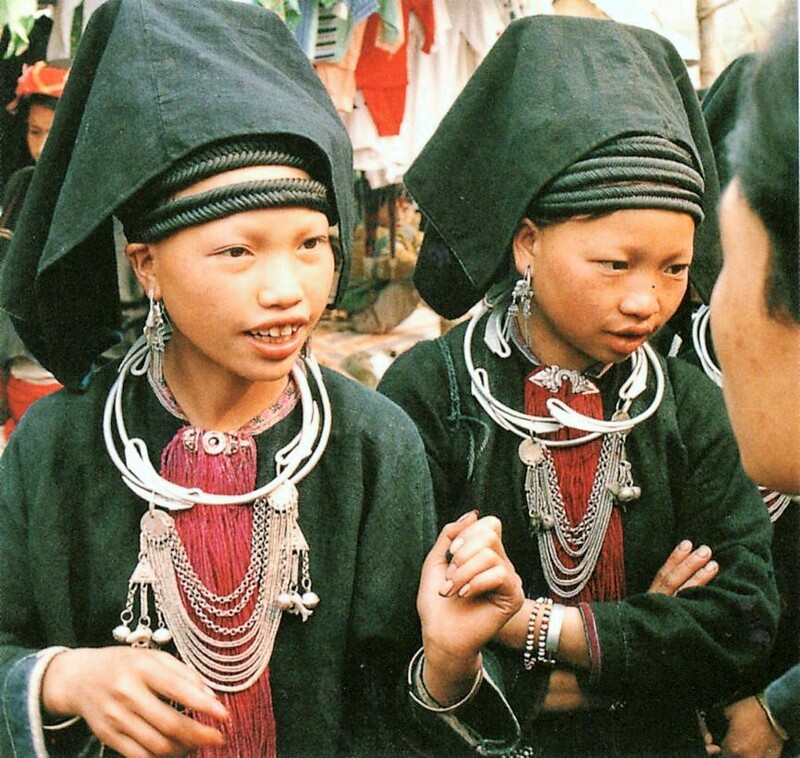 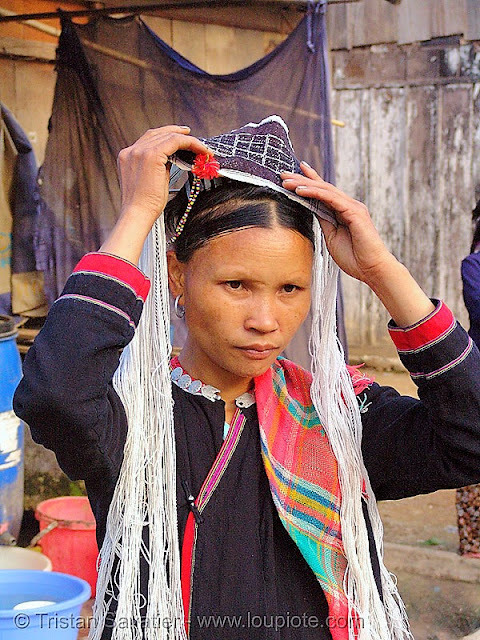 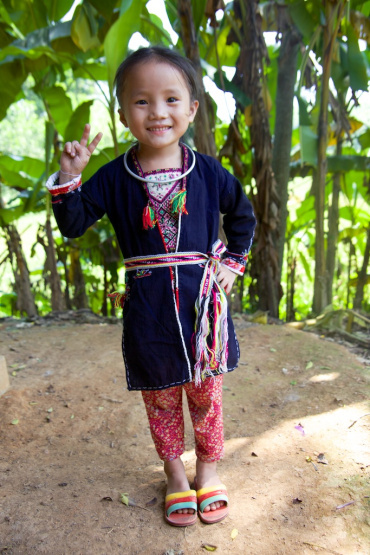 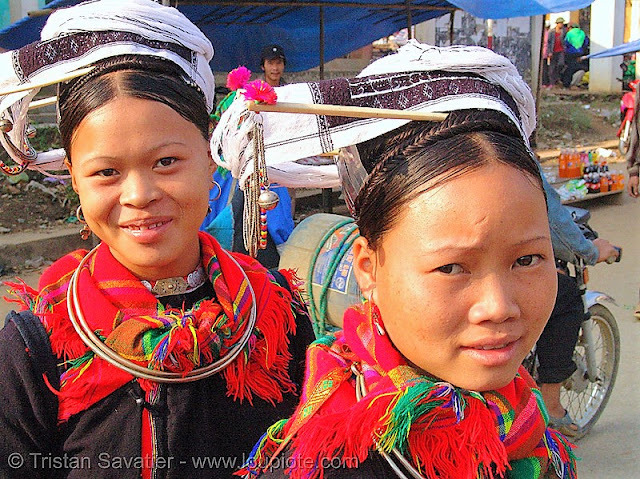 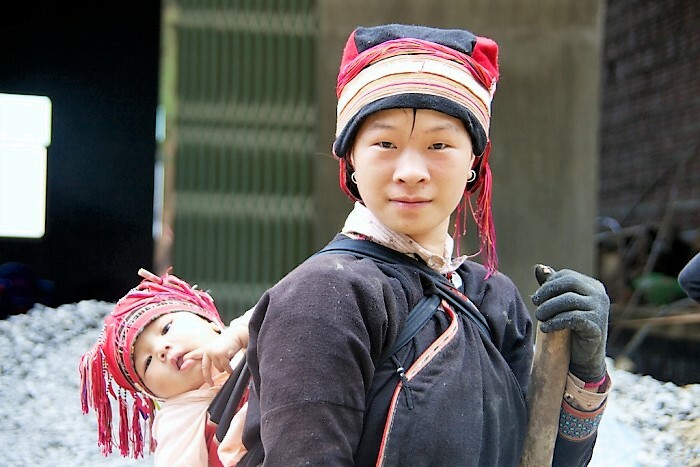 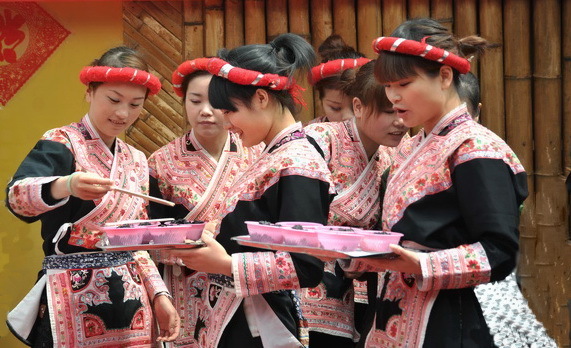 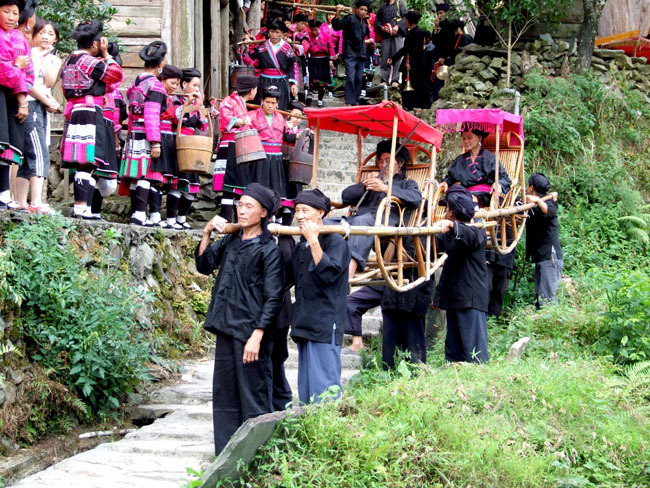 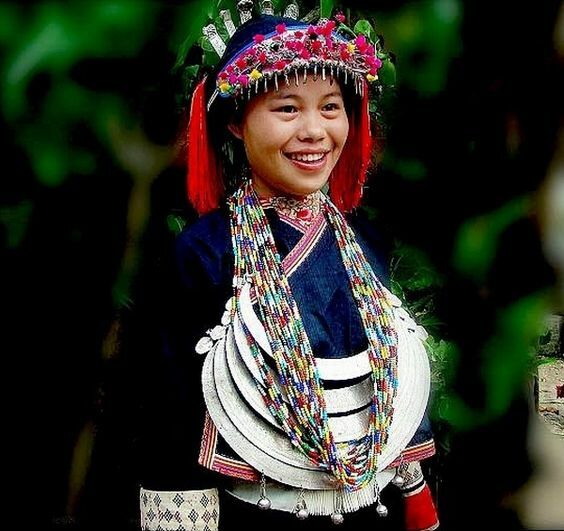 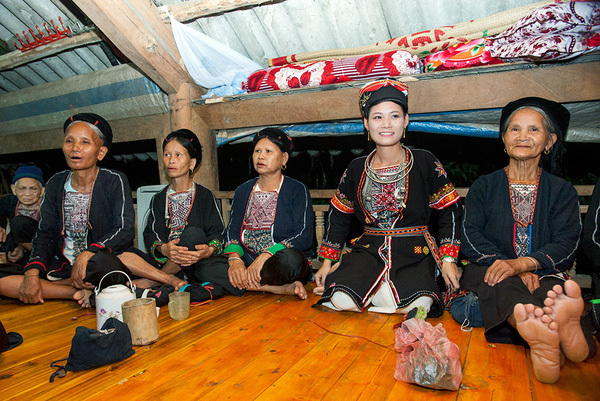 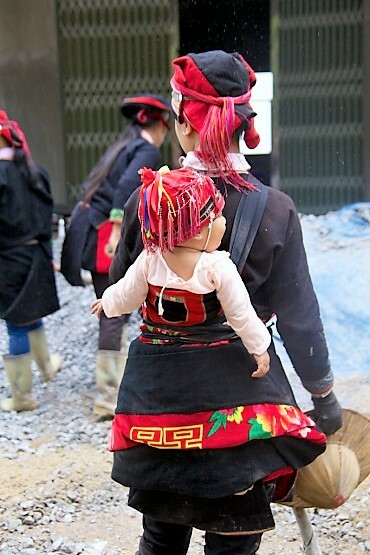 The She are not considered to be Yao or Miao, but they speak a language from the same family. 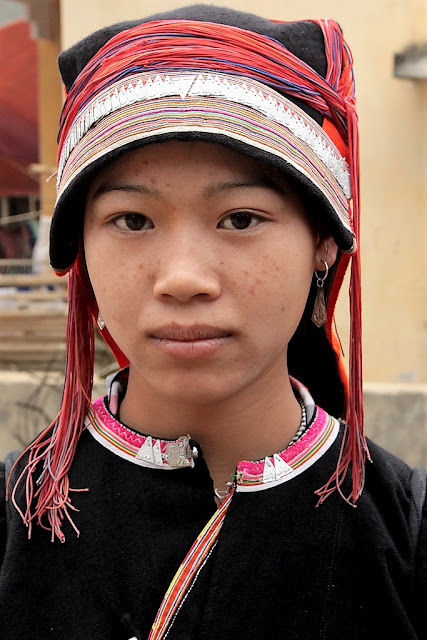 Some linguists place this language in a third branch of the Hmongic/Mienic language family. 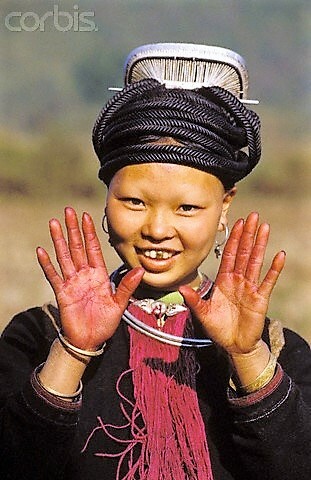 The She have a similar origin story as the Yao. Their ancestor was named Pan Hu, who helped a Chinese King defeat his enemies and was given his daughter in marriage as a reward. 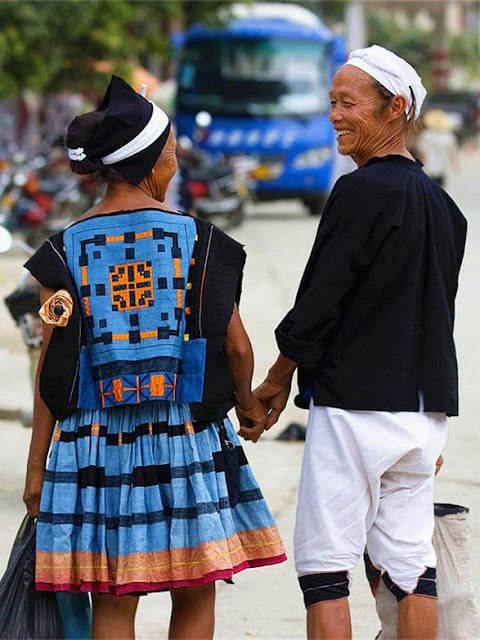 She women make a point of embroidering Phoenixes on their clothing as a symbol of their ancestor. [The Phoenix is the symbol of the women of the Royal House.] 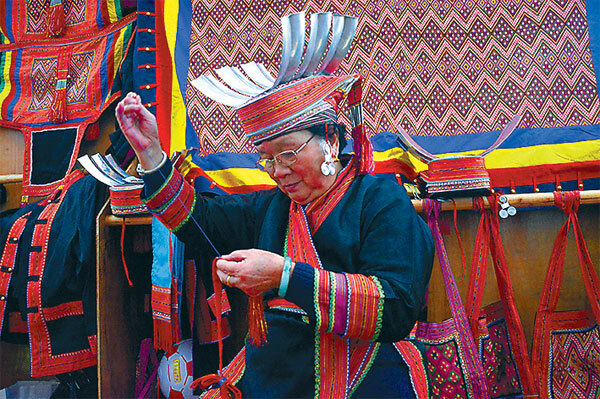 Of the 409,000 She alive today, only about 1,200 still speak their ancestral language.The rest speak Hakka Chinese, but have kept alive their cultural identity. 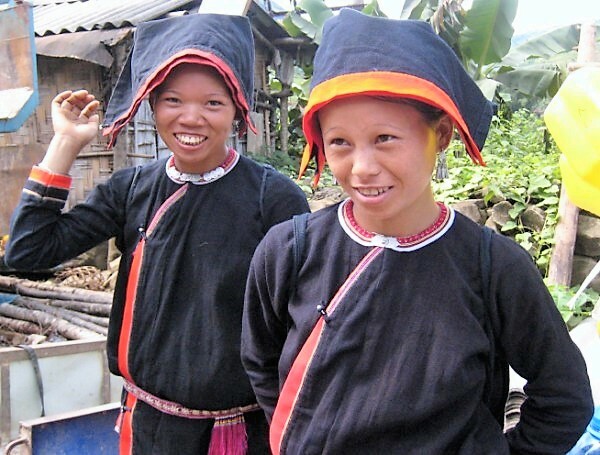 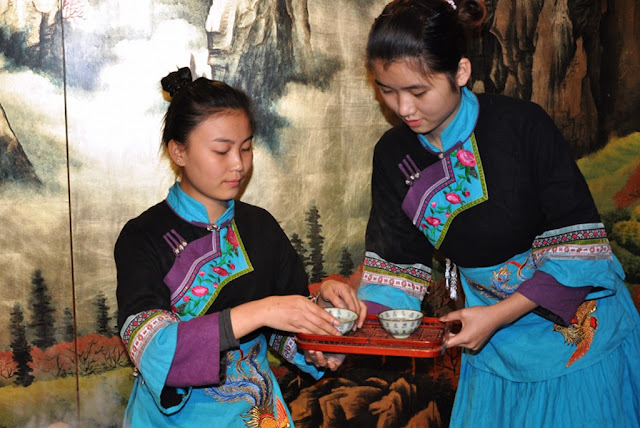 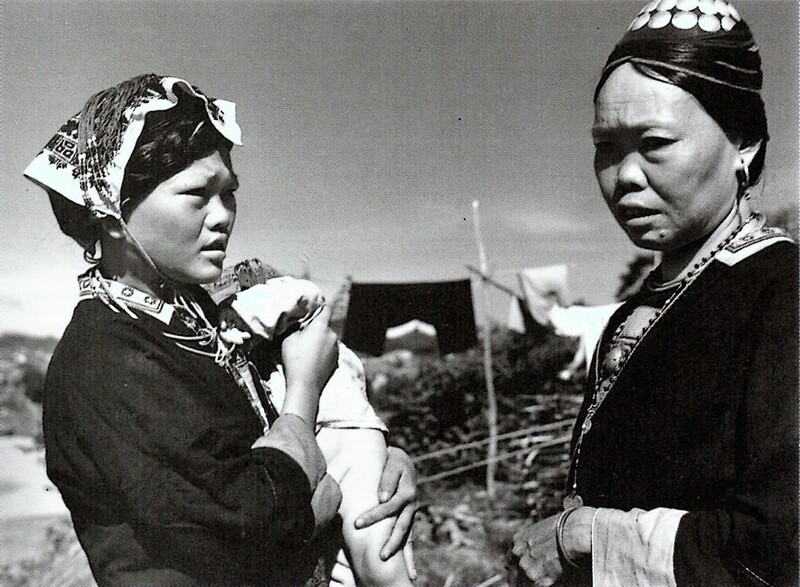 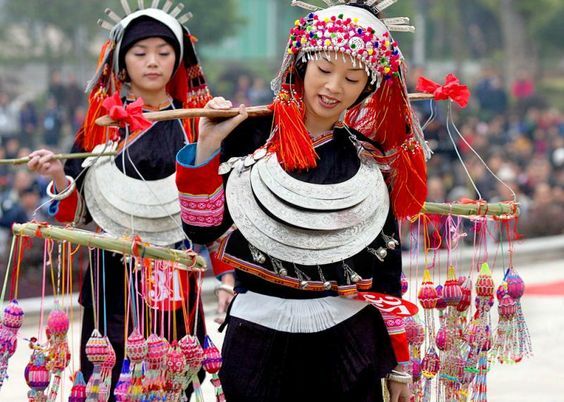 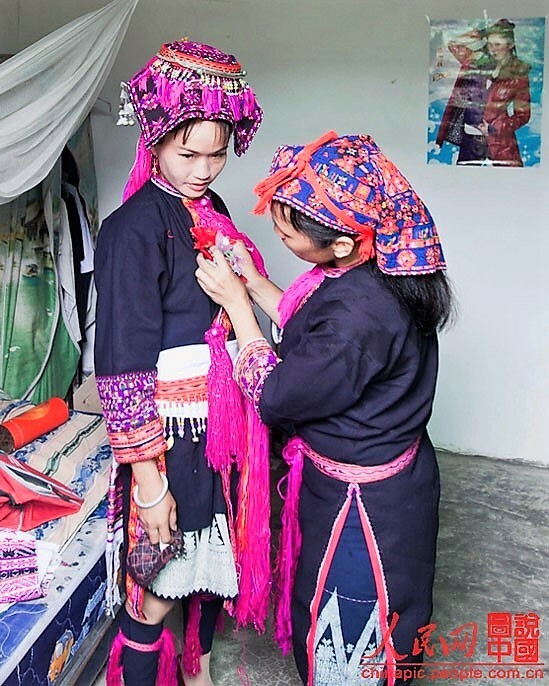 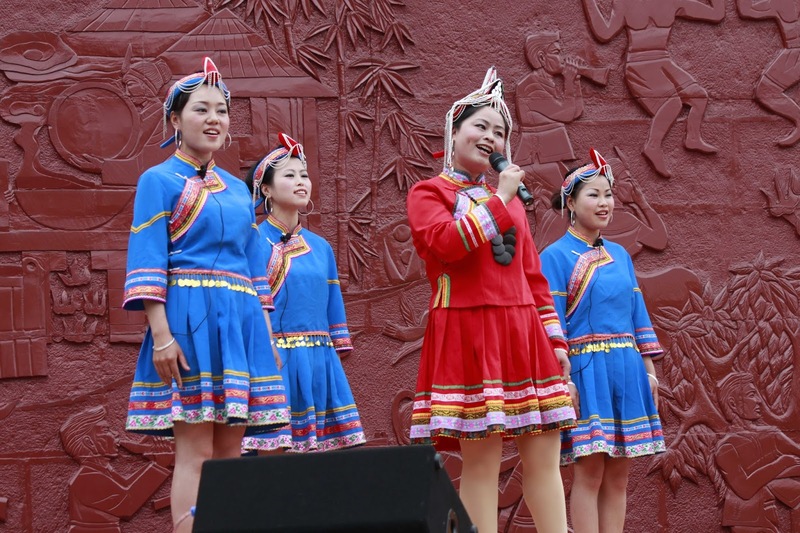 The She are found far east of the Miao and the Yao, mostly in Fujian and Zhejiang provinces, although the few who still speak the language live in Guangdong province, not all that far from Hong Kong. 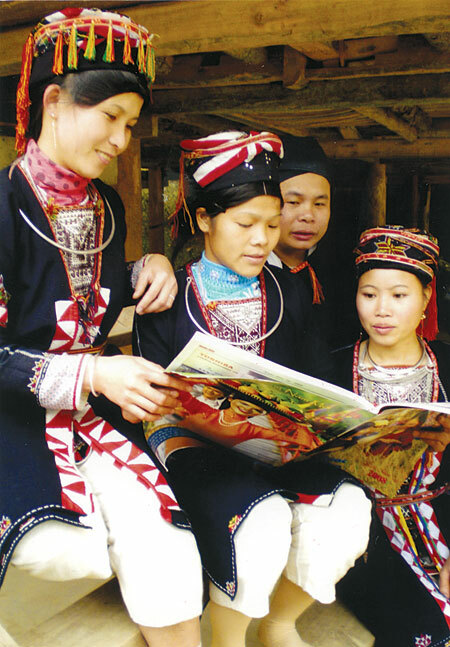 They call themselves and their language Ho Nte, and are shown in the map at the head of the article. Here is an Ethnolinguistic map of China which shows the location of the She. It is thought that the She were originally fishermen, and were forced into the hills by the southern spread of the Han Chinese people. 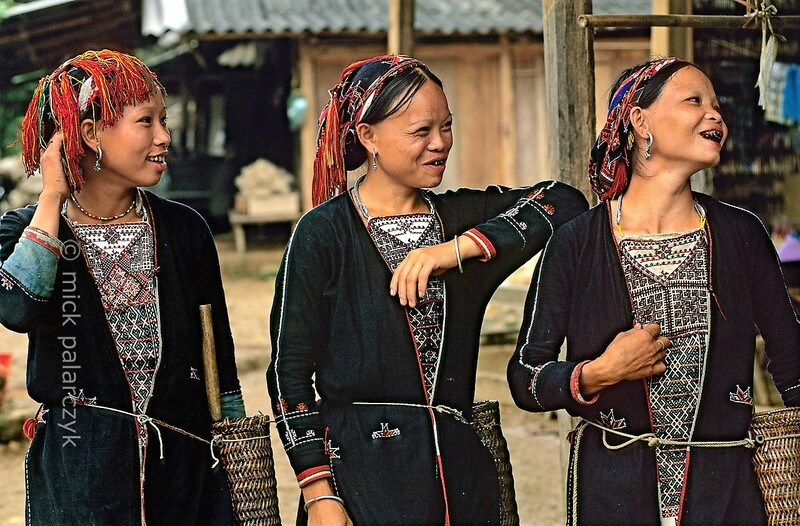 They have lived in Southeastern China for a long time. 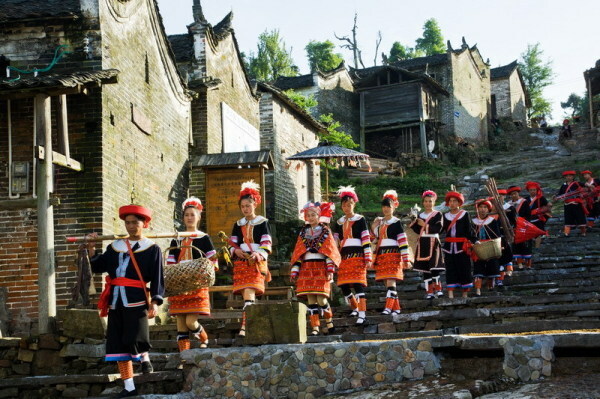 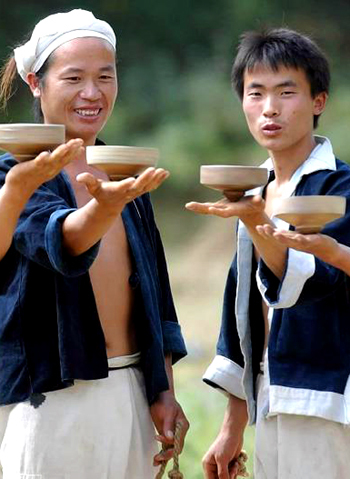 Although there are not many of them, they live in scattered communities among the Han. Much is made of some of the unusual hair arrangements which they have. 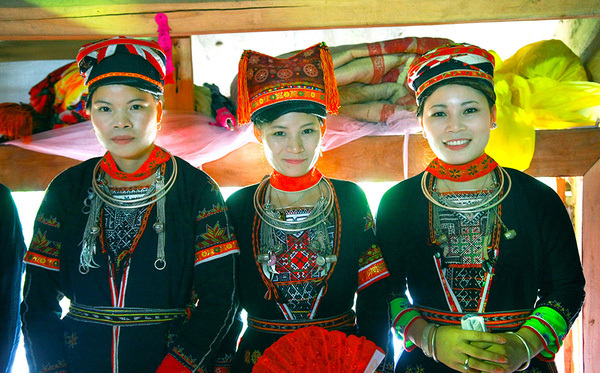 The Mienic branch of the Hmong/Mien or Miao/Yao language family has four main languages: Iu Mien, Kim Mun, Biao Min and Dzao Min. Like the Hmongic peoples, however, Both China and Vietnam consider all these to be one people, called Yao.The Pa Hng, Bunu, and Lakkia are also considered to be Yao, even though they do not speak Mienic languages, as they share much of the same culture. 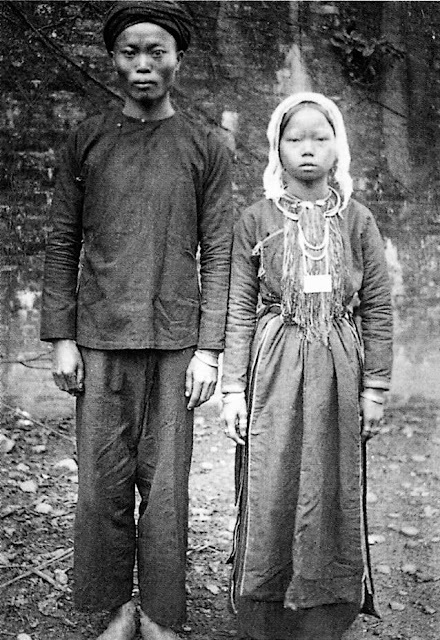 One of the stories told about the Yao ancestor, Pan Hung, is that he came to the assistance of a Chinese King by killing his enemy and bringing back the head. 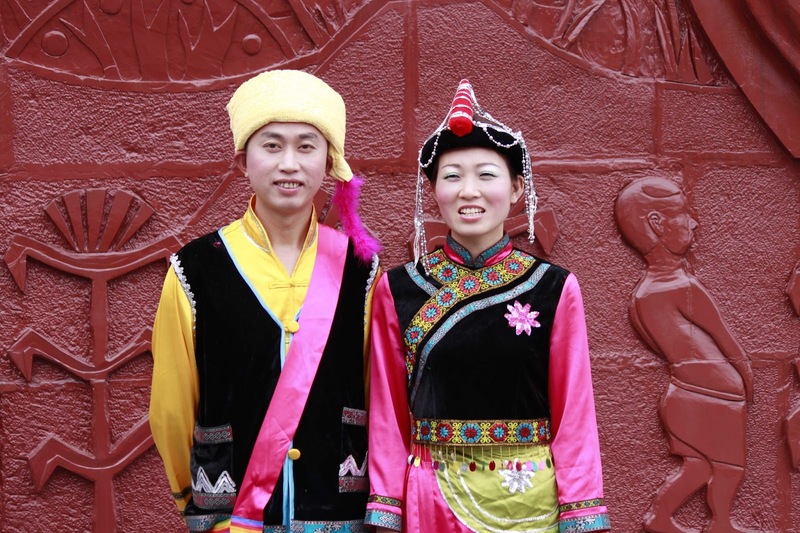 The King had promised not only his daughter in marriage to whomever could do this deed, but also half of his kingdom. 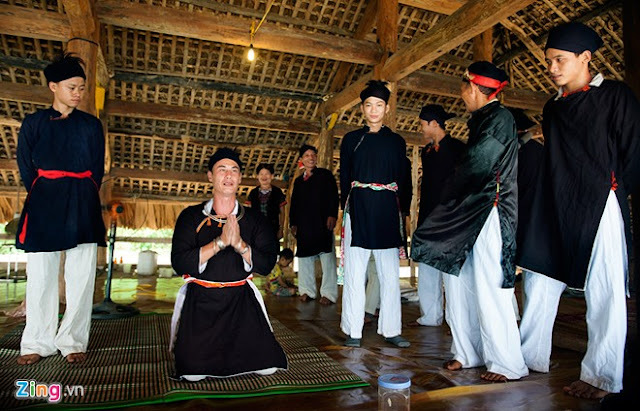 Being faced with such a loss, he was in a panic, but following the advice of a wily counselor, gave to P'an Hung and his descendants the 'upper half' of his kingdom. 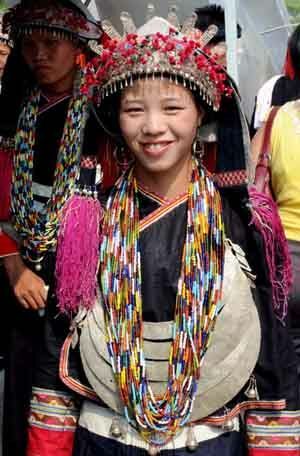 Thus the Chinese live in the lowlands and valleys, and the Yao live in the hills and the mountains. 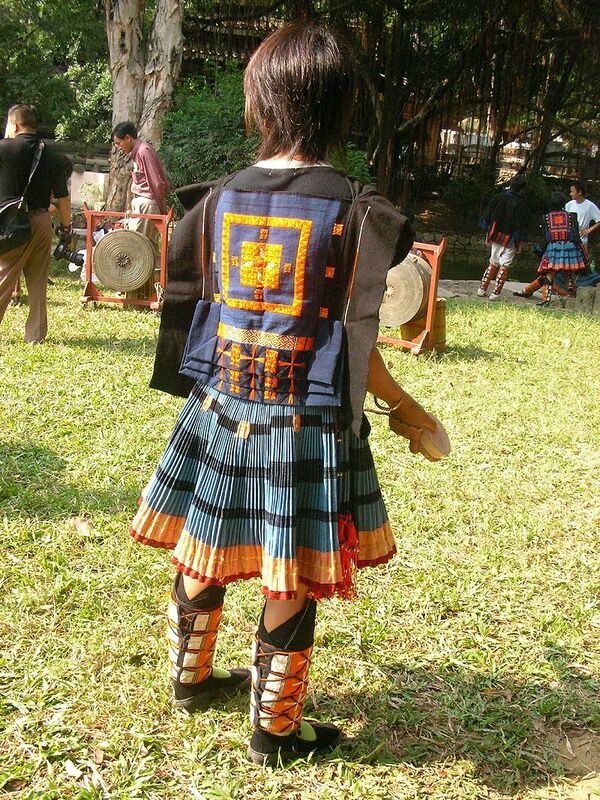 About 60,000 speakers. 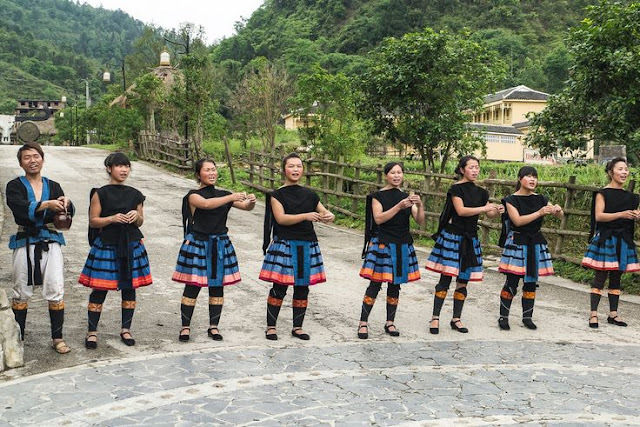 As you can see from the map above, this group lives in northern Guangdong province, and over the northern border into Hunan province. About 43,000 speakers. 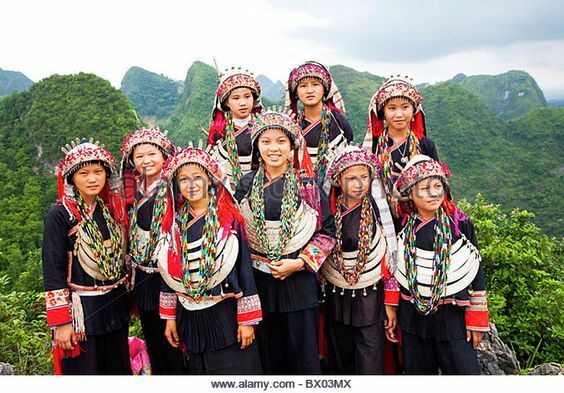 This group lives in northeast Guangxi province. 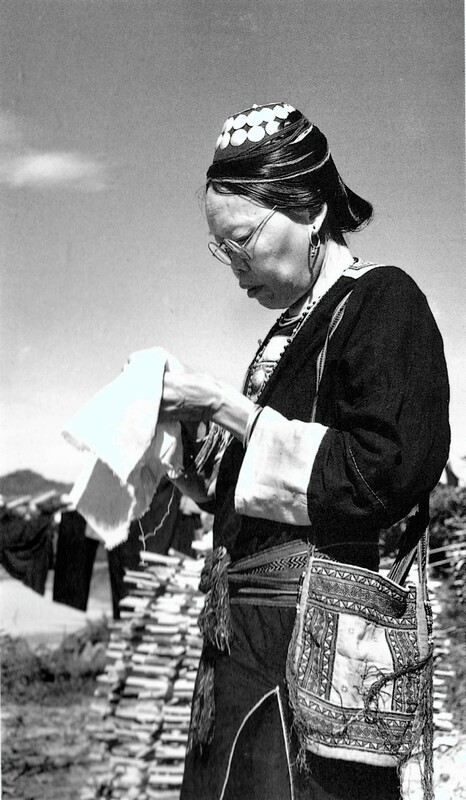 The various Yao groups converted to Daoism at some point. 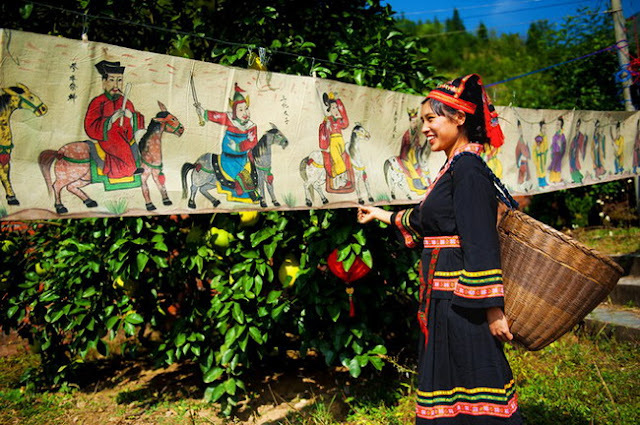 Here is a Woman in front of a group of Daoist icons. 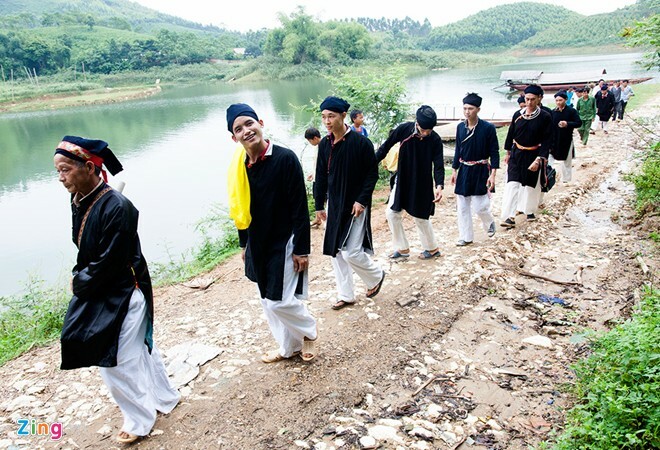 Taoist priests leading a procession for a festival. 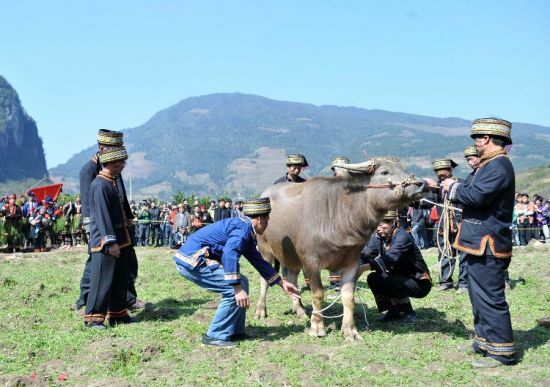 Yao men sacrifice a buffalo to their ancestor, P'an Hung, the Dragon Dog. 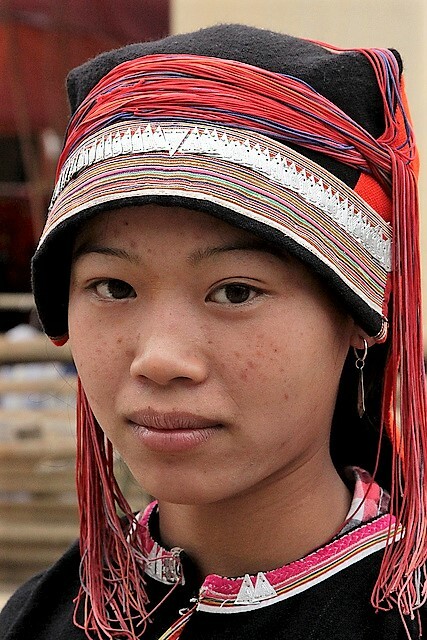 The next couple of groups do not speak Mienic languages, but are considered Yao. 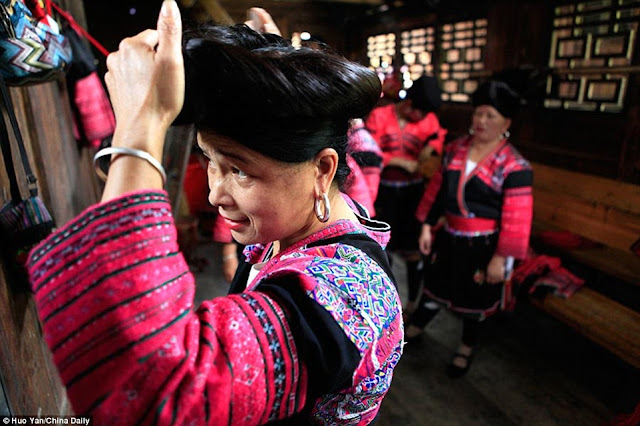 This language has a few thousand speakers. 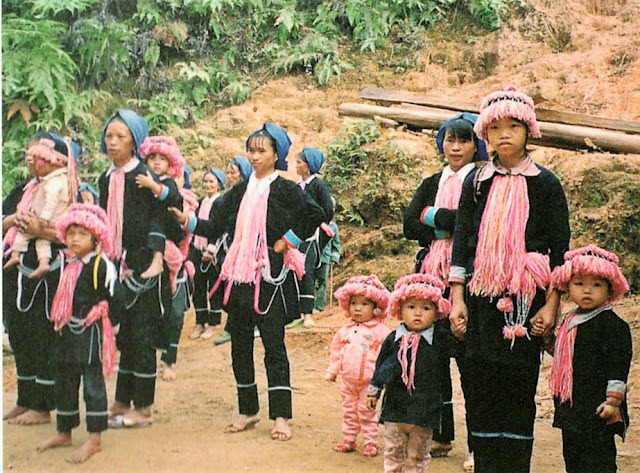 It belongs to the Hmong-Mien language family, but seems to form another branch, divergent from the others. They occupy an area just to the west of the Biao Min. 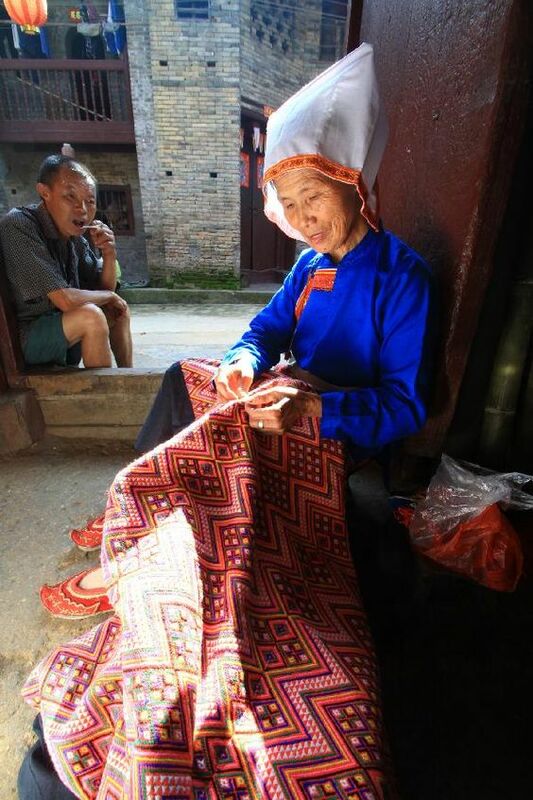 In Longli Huanglo village of Longsheng county, Guangxi province, some Pa Hng speakers are called Red Yao, which are not to be confused with the Red Yao of Vietnam, who are Mien. 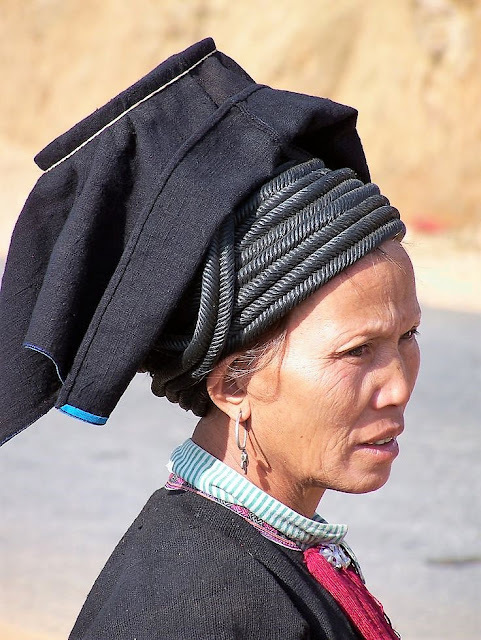 The women do not wear turbans, but instead wind their uncommonly long hair around their heads. 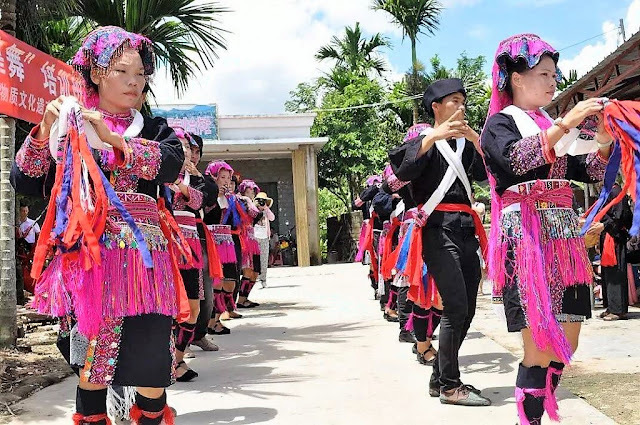 These people are not shown on the map at the head of the article, but live about where the g and x of the word Guangxi are placed, in Eastern Guangxi province, specifically, Jinxiu Yao Autonomous County. They are generally called the Chashan Yao, or Tea Mountain Yao. 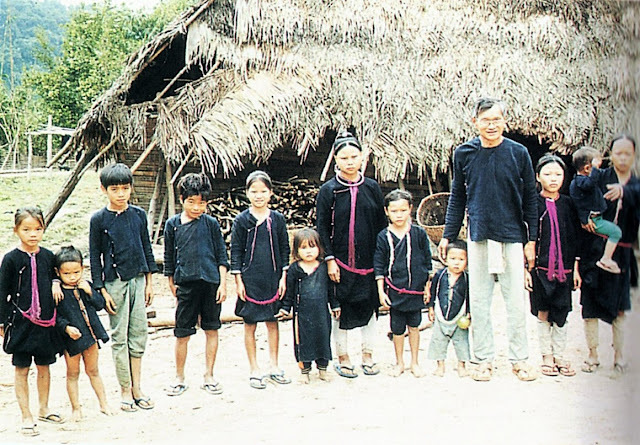 They actually speak a language which belongs to the Kam-Sui branch of the Tai-Kadai language family. 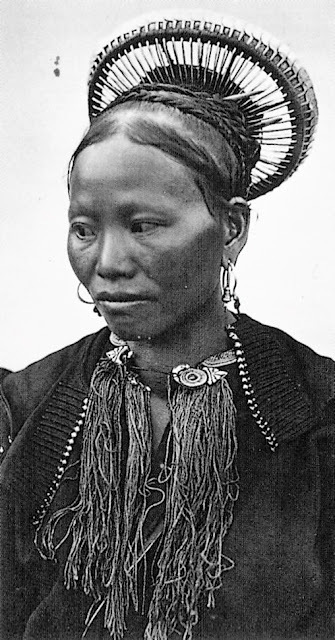 The women's costume is distinguished by the three large silver plates on the headdress. 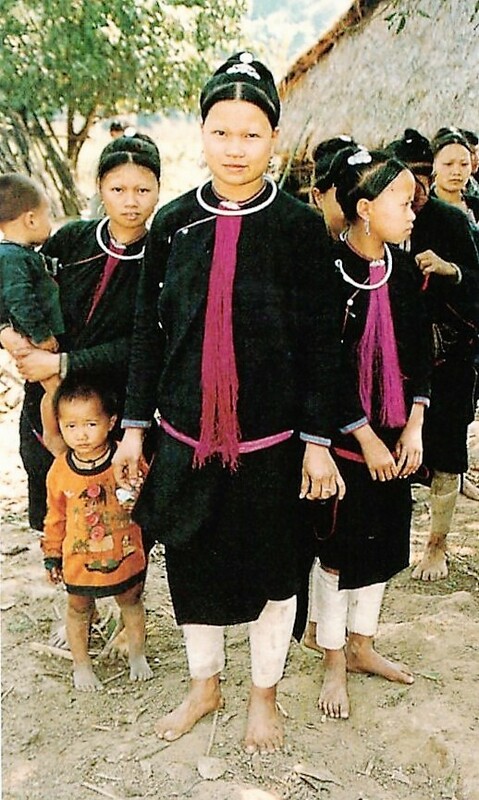 The Bunu are several groups which are considered to be ethnically Yao, but speak Hmongic languages. Linguists often group the various dialects into 4 languages, but are divided on the issue of whether they are closely related to each other. 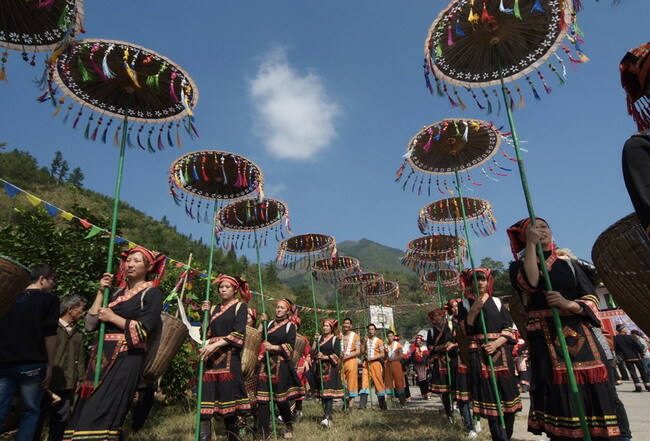 There are about 50,000 of them. 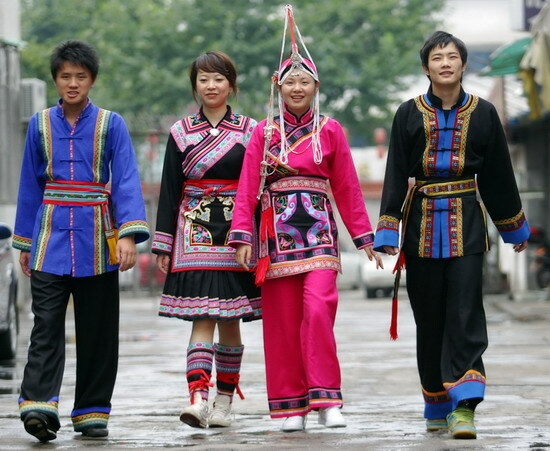 One group of these are the Dounu, which the Han call the Baiku Yao, or White pants Yao. 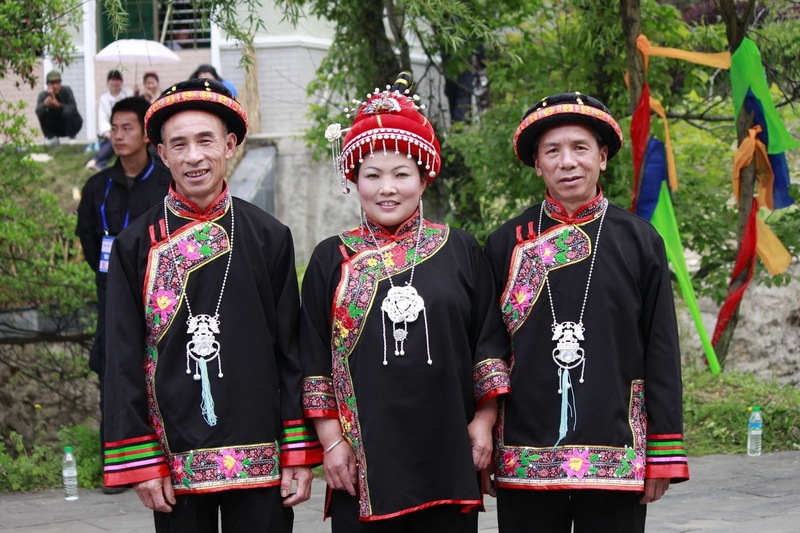 The costume of this group commemorates one Yao King whose seal was stolen by a Zhuang General, who also wounded the King. 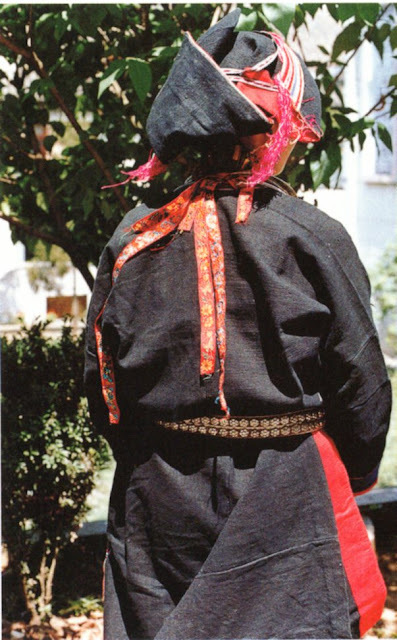 The seal is reproduced on the womens' jackets, and the five red streaks on the mens' pants represent the wounded King's fingers. 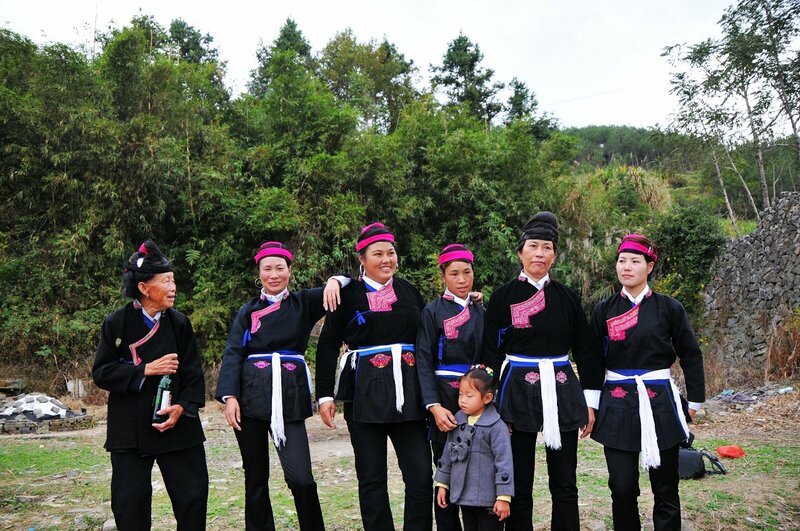 Here are more images of other Bunu groups. 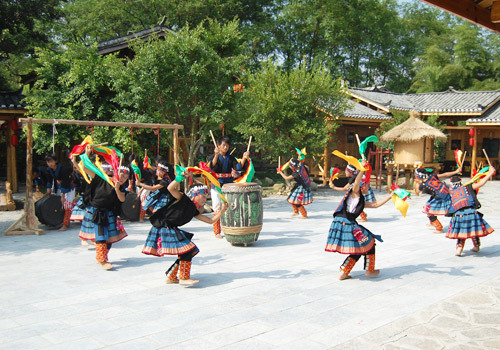 The last two groups are by far the largest. 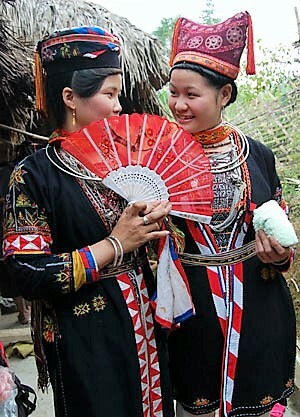 Both are found in the western part of this area, from western Guangxi province into Yunnan, Vietnam, Laos and Thailand. 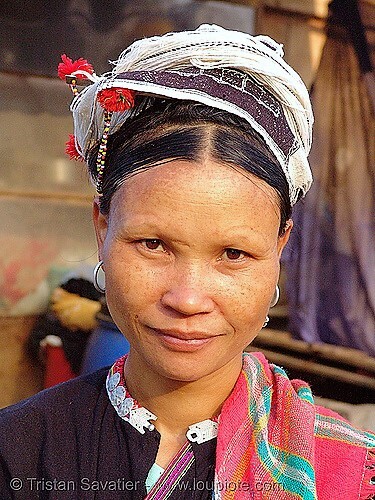 There are about 400,000 of these people. They are sometimes also called Lanten. 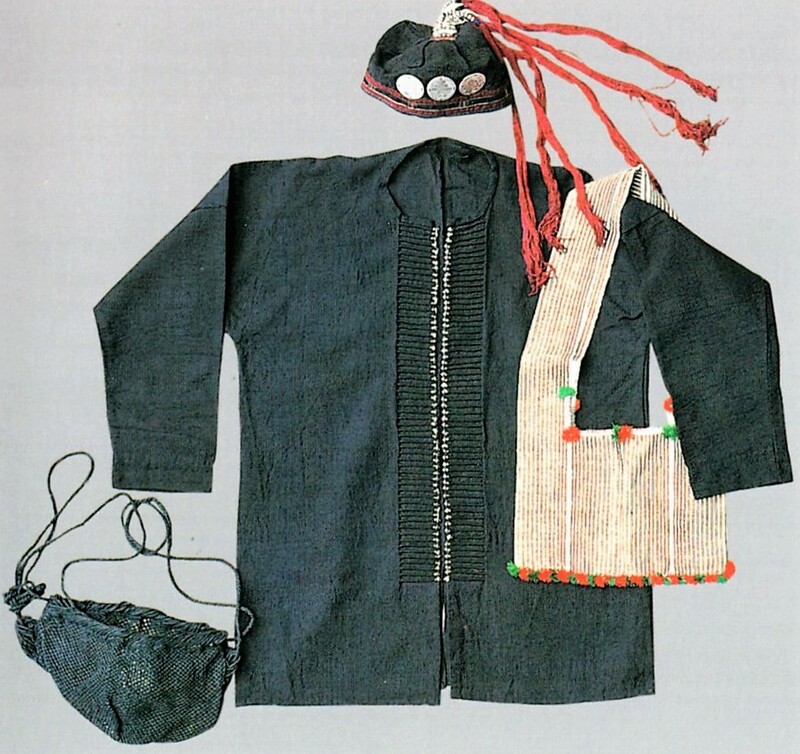 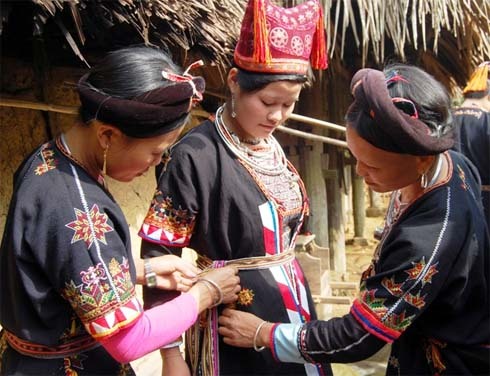 They use less embroidery on their clothing than the Mien, but it is as fine in quality, and often confined to the headcloth. 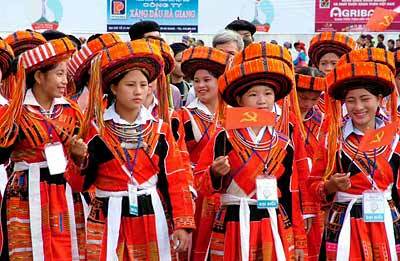 They love red pompoms, tassels and streamers, as do also the Mien. 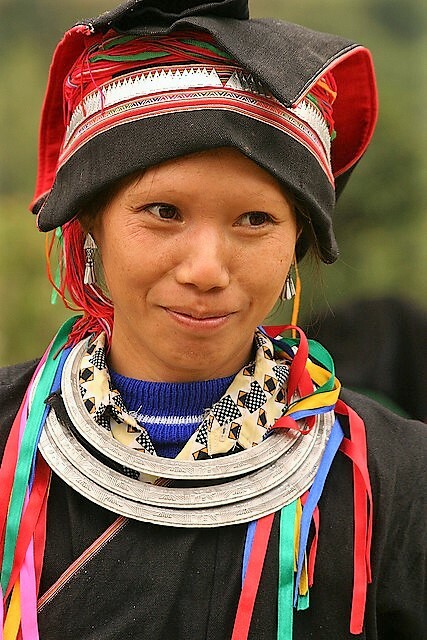 They tend to live at lower altitudes than the Mien. The natives of Hainan speak Tai-Kadai languages, the Li or Hlai in the south, and the Ong Be in the north. 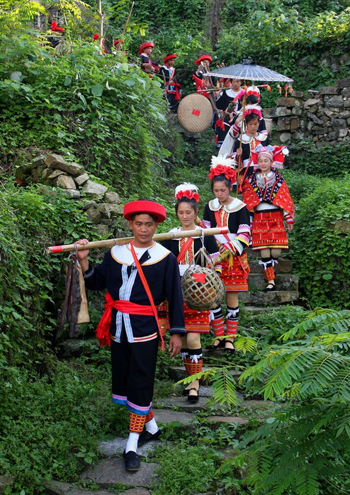 Han Chinese have settled the island, and there are also scattered pockets of Kim Mun, who for some reason are traditionally called 'Miao'. 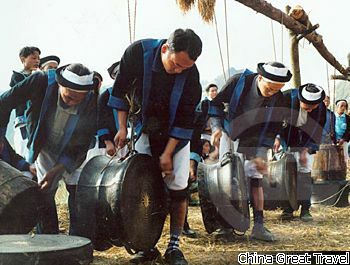 They were brought in to act as garrisons in the 18th cent. 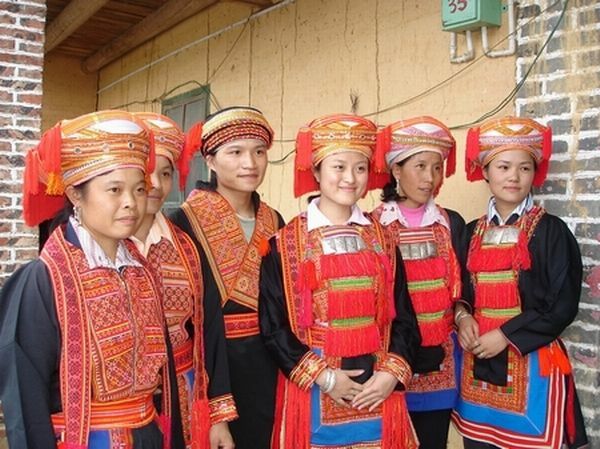 This is the only group of the Kim Mun in which the women wear a skirt. 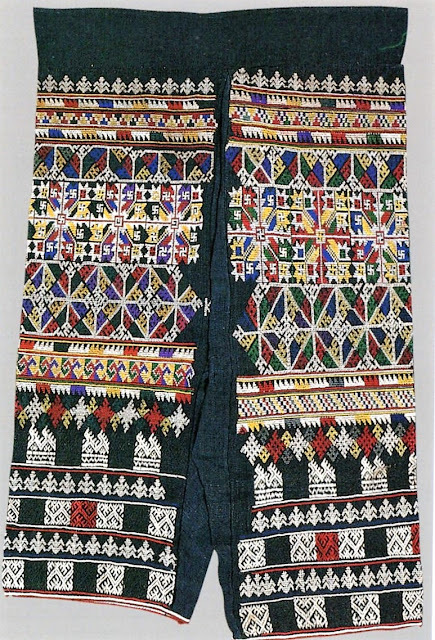 The skirt is ornamented with batik, always in the same pattern. The top is as long as the skirt, so it is only visible through the slit on the side. 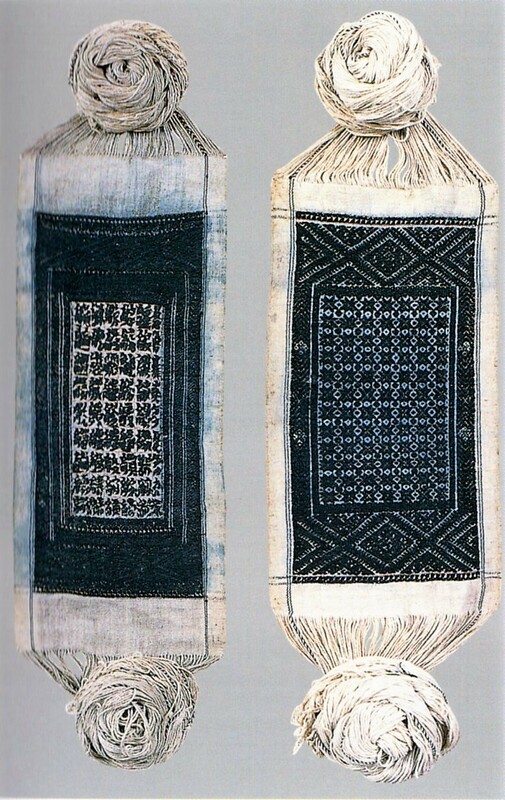 The headcloths have very beautiful embroidery. 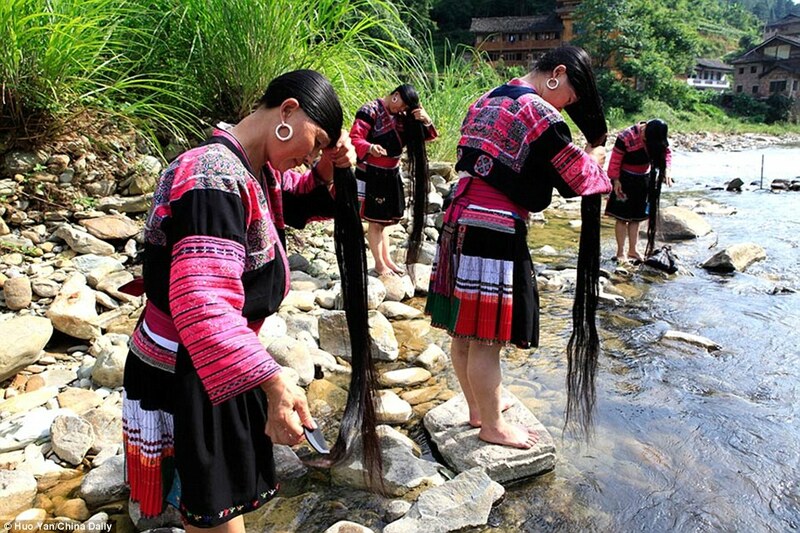 This branch is found in China, western Guangxi and southeast Yunnan provinces, Northern Vietnam and Laos. 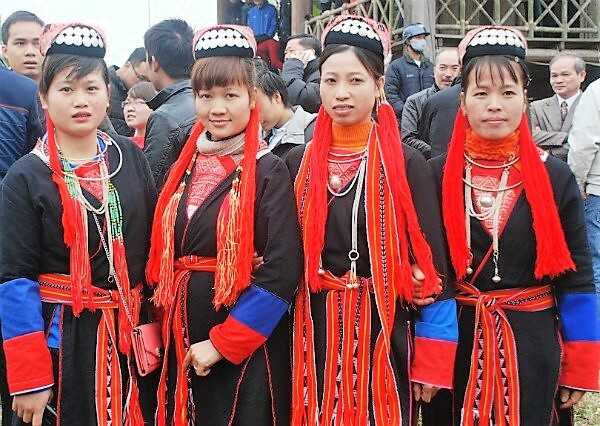 The costumes of the different branches of this group are very similar, the distinction being in the headpieces. 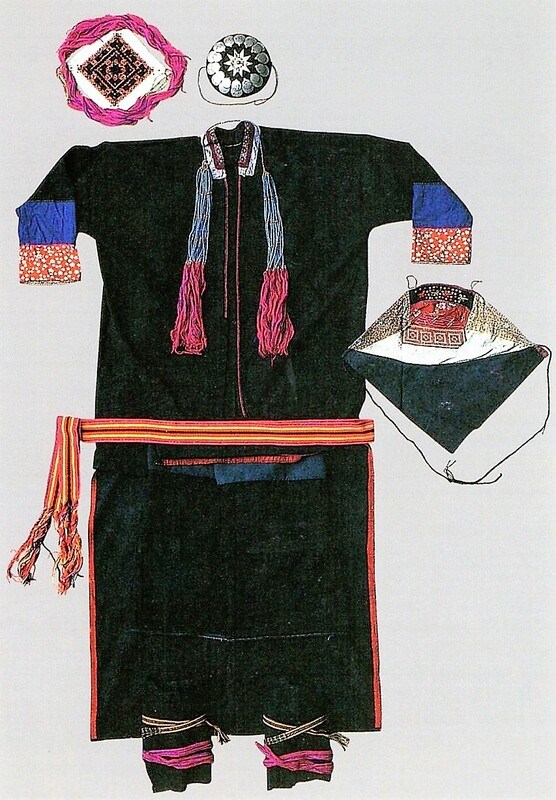 Here is a typical costume. 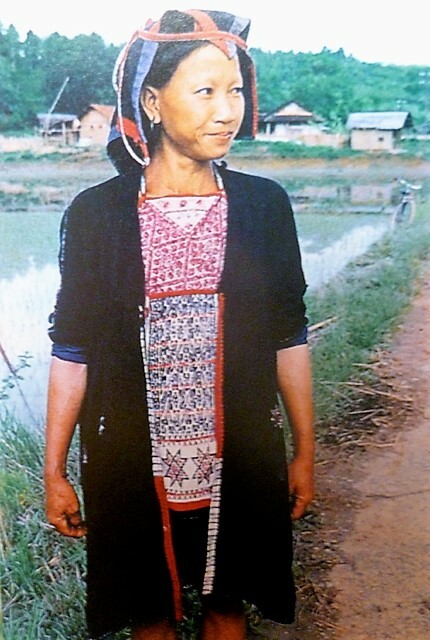 This particular one is from Laos. 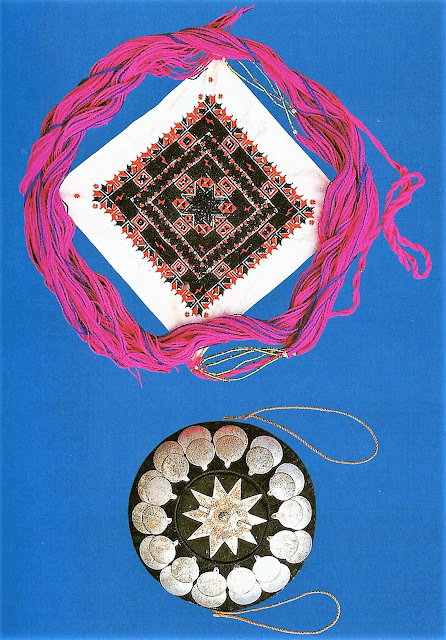 The various white embroidered headscarves come from different sub groups. 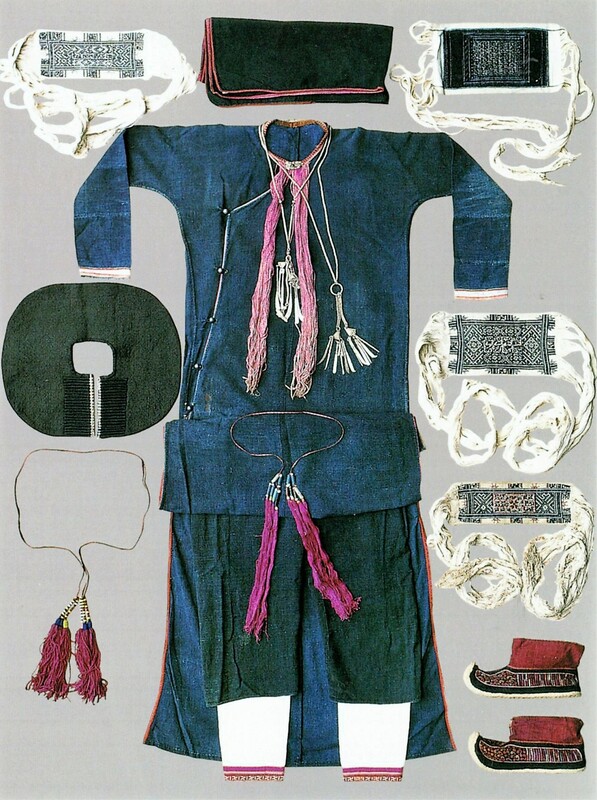 There is a separate collar, tunic buttoned to the side with red piping, narrow pants that come just below the knee, white leggings, and long red silk tassels attached to both the sash and a silver neck ring. 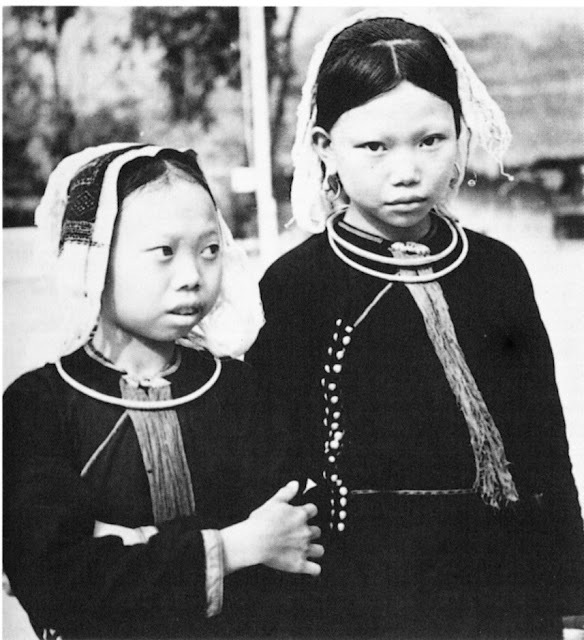 Some young girls wear the white headscarves by themselves, as these two from Phong Tho, Vietnam. The long fringes are folded back. 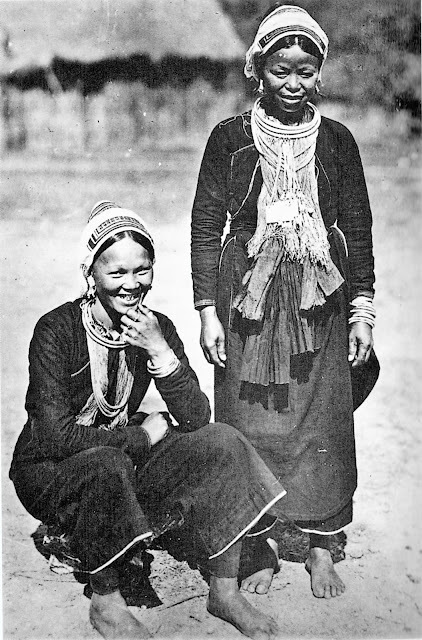 Or these girls from Laos. 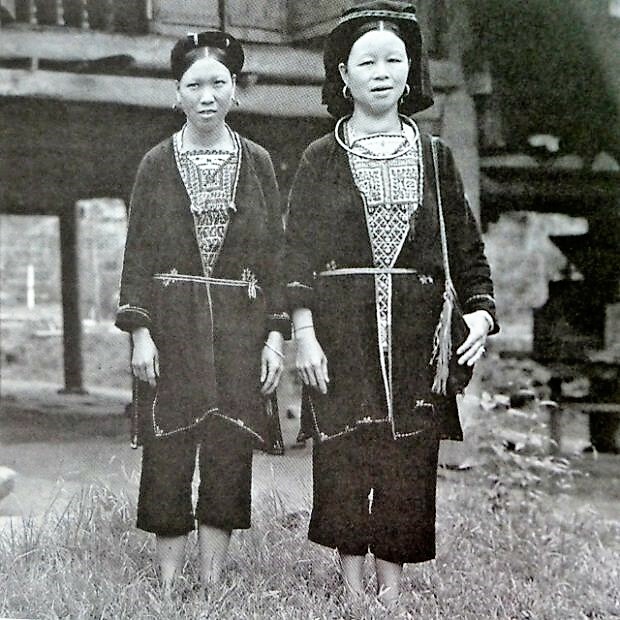 Both of these pictures were taken in the 1920's. 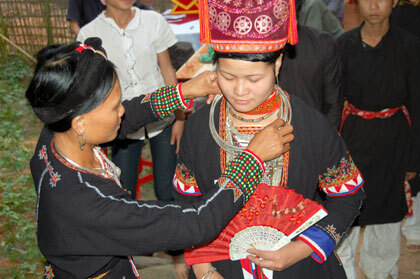 When a woman comes of age and is initiated, then she is permitted to wear the celestial crown. 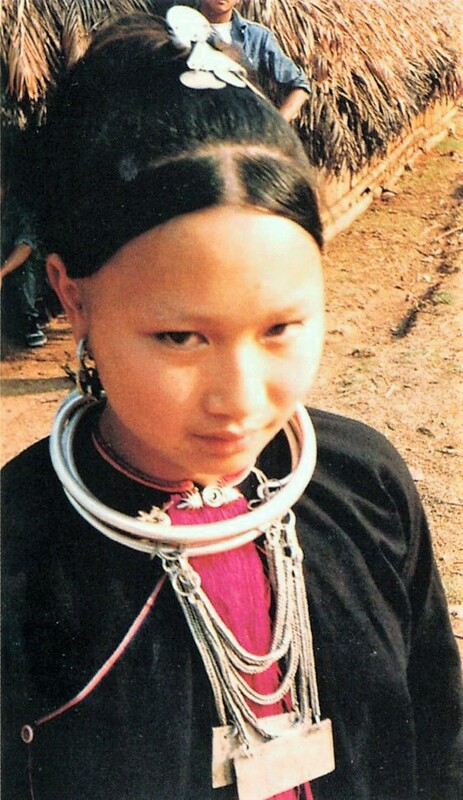 The front hair is parted, and the hair in back is put into a bun. The crown always has sunrays on it, and is surrounded by a circle of hair pins. This is usually covered by a scarf. 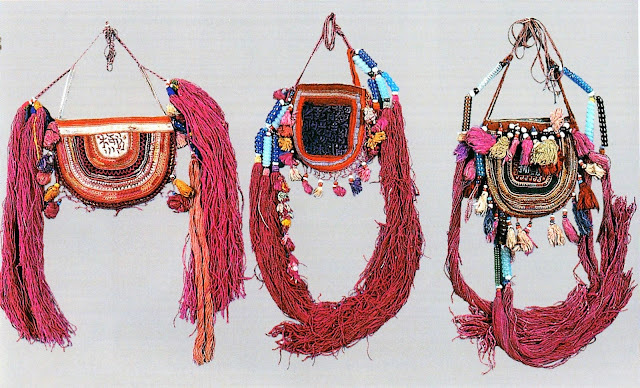 Depending on the group, there can be up to 200 of these pins. 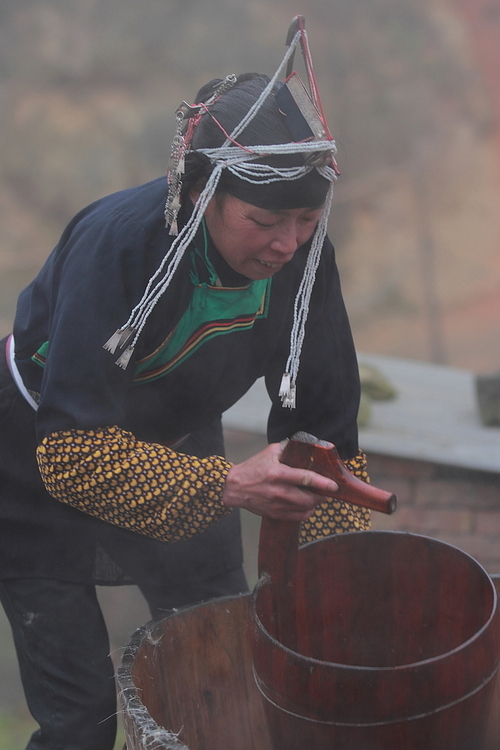 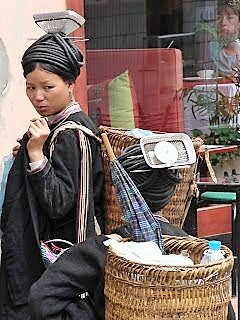 like this woman from Motiang in Yunnan. 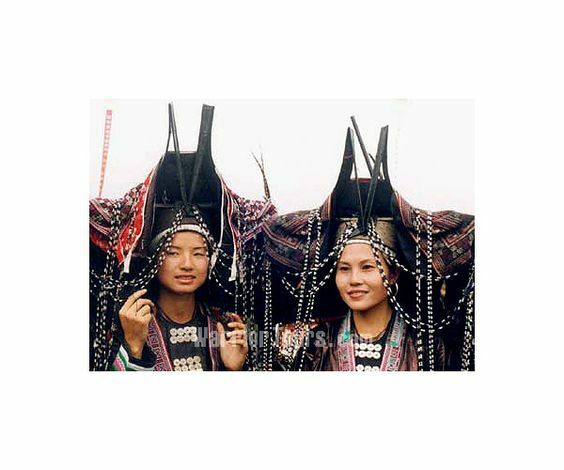 There is one large group which is found in both Yunnan and Vietnam, in which the crown of pins is rectangular. 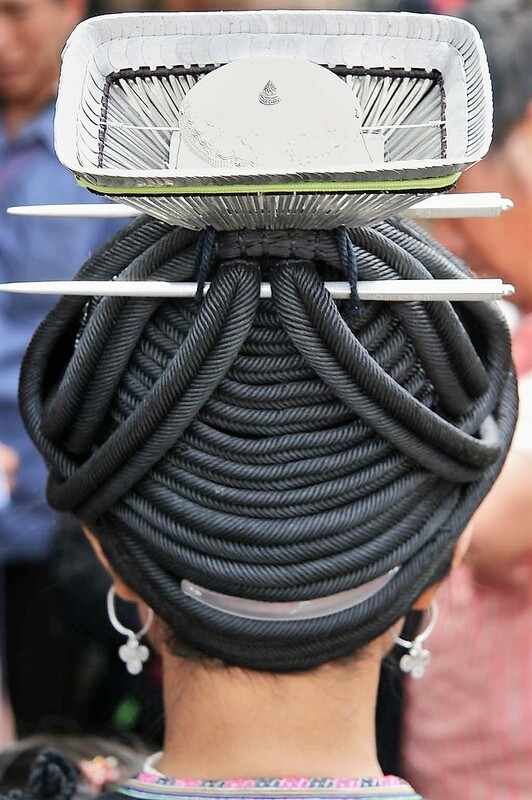 This is accompanied by braids of fake hair. 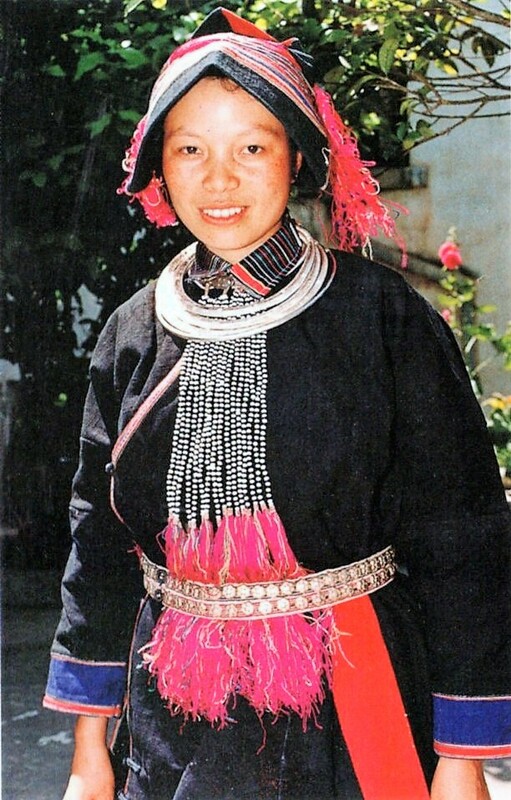 Usually this is worn with a scarf on top. In this image, you can see some young men in costume on the left. 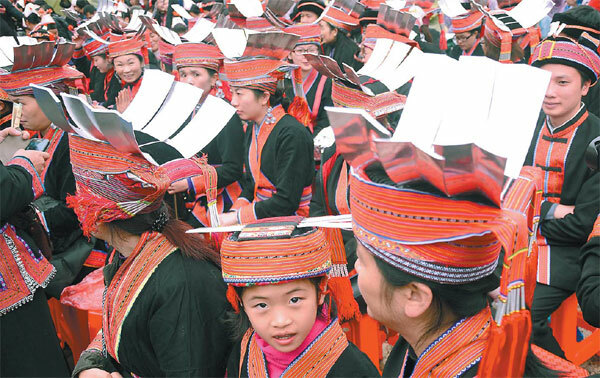 The cap with the streamers is worn by boys and unordained men. 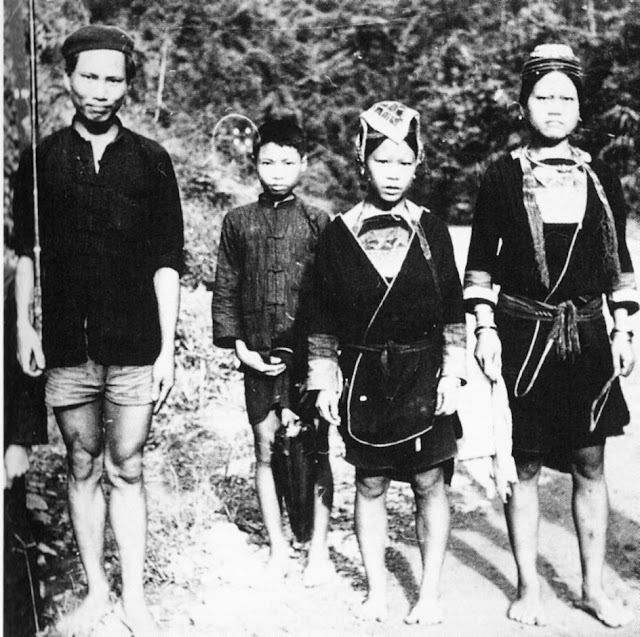 This next image shows two Kim Mun Lanten Sha men with a friend who is Kinh Vietnames in the center. 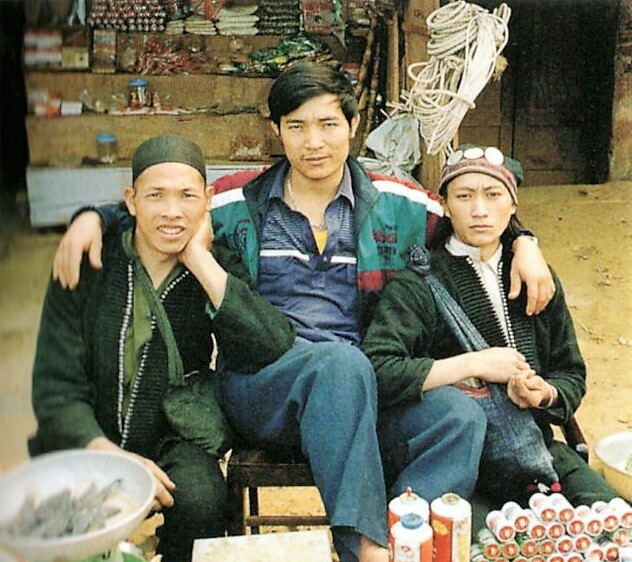 The man on the right wears the lay cap, and the man on the left wears the cap of an ordained Taoist priest. 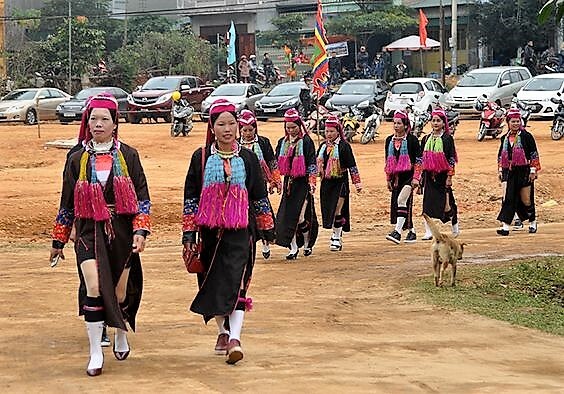 This image is from Phong Tho, Lao Cai province, Vietnam. 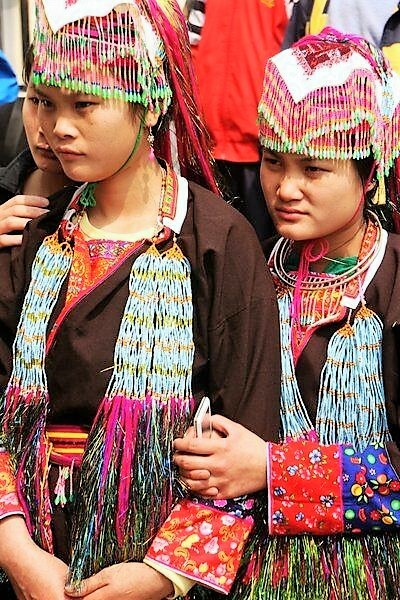 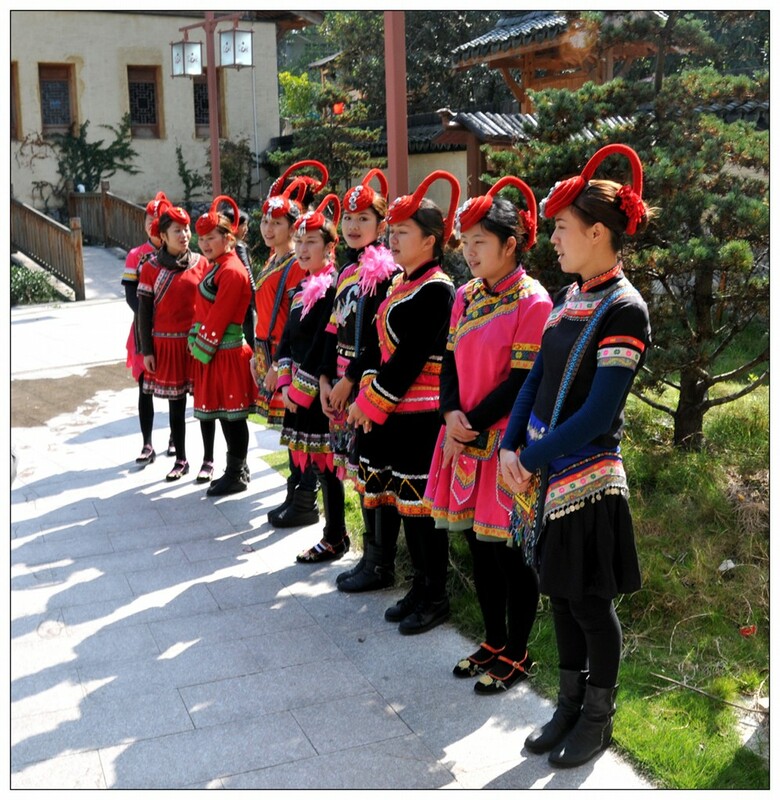 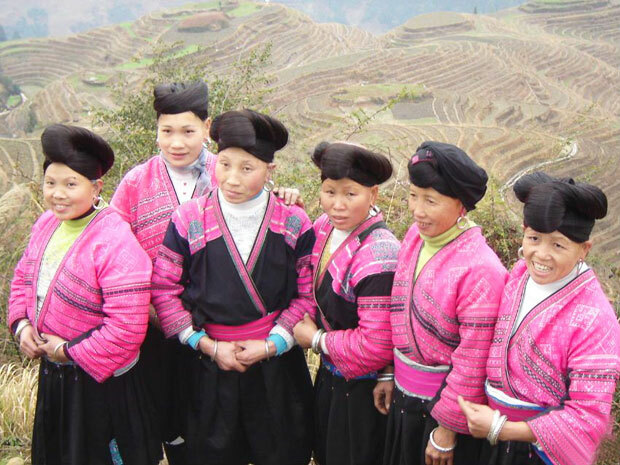 Here are two images from Hekou in Yunnan province, China.This group has traded their red tassels for pink ones. There is only one group found in Laos, around Luang Nam Tha. 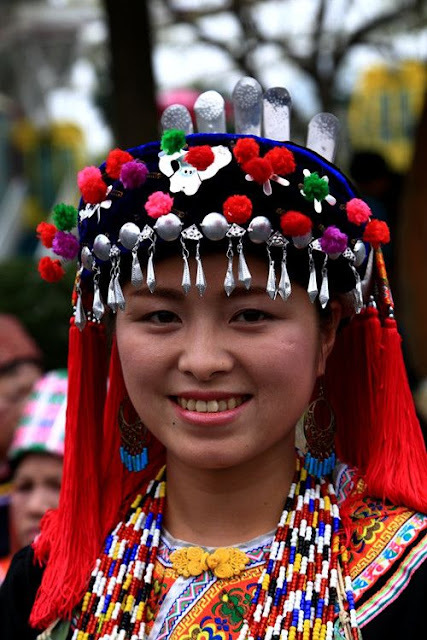 They do not wear the celestial crown everyday, but reserve it for special occasions. 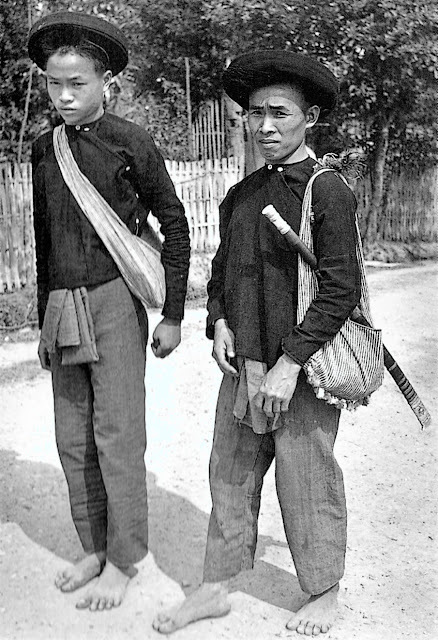 This is a photo of a village headman and his son from Laos, taken in 1952. 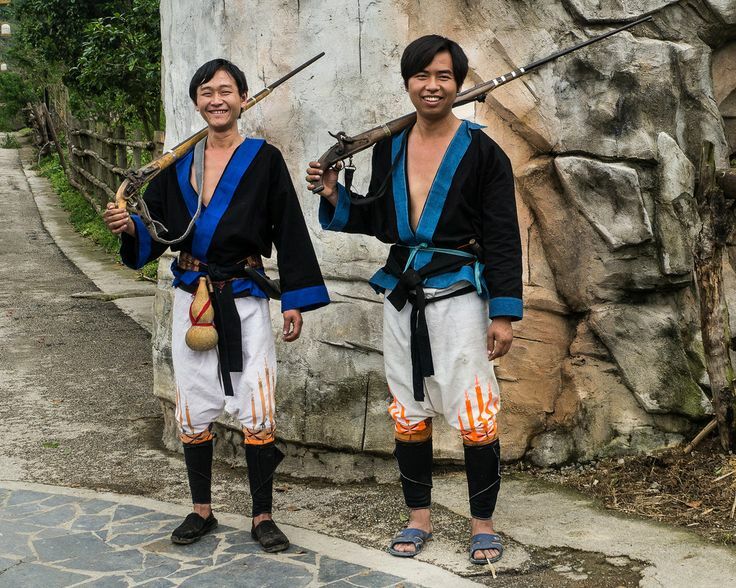 His status is indicated by the Shan sword with silver pommel. 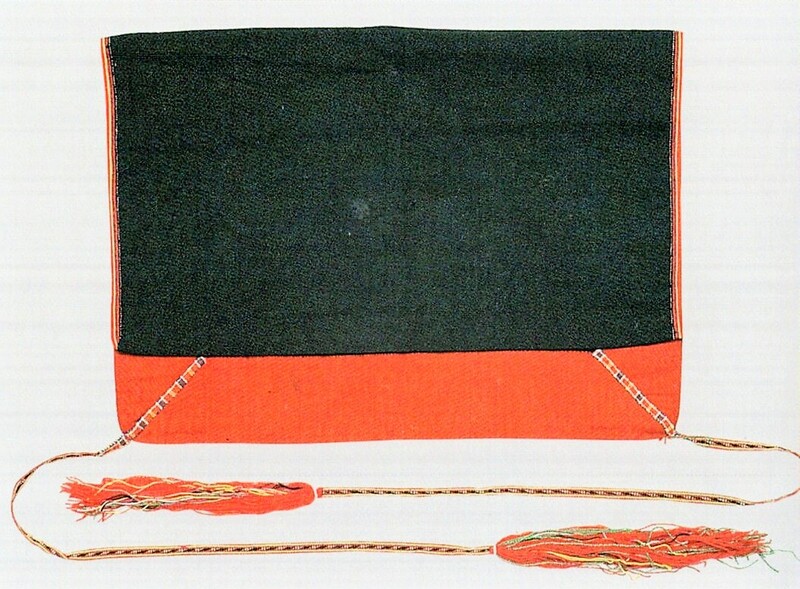 The restraint shown by the Kim Mun Lanten Sha in their clothing apparently disappears when making bags, the design of which are not dictated by tradition. 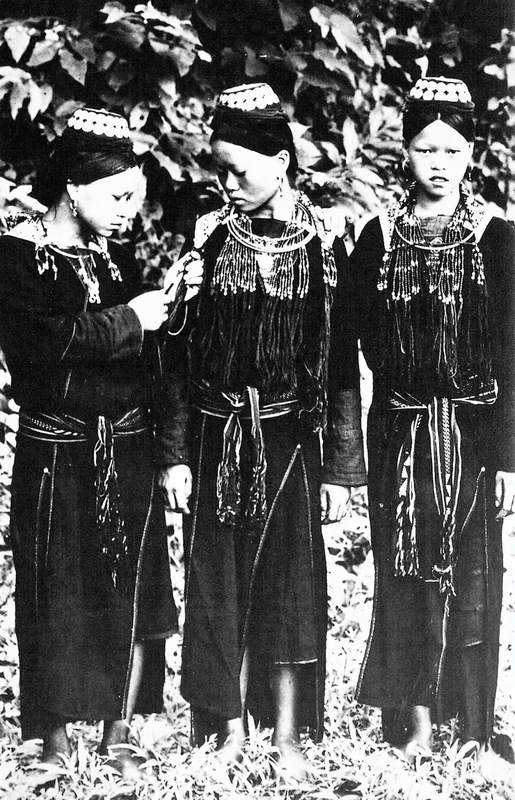 This is a sister branch to the last one. 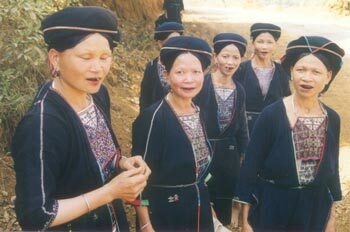 They are found in Yunnan, in Hekou, Maguan, Malipo, Funing, Shizong, Luchong, and Mugang. 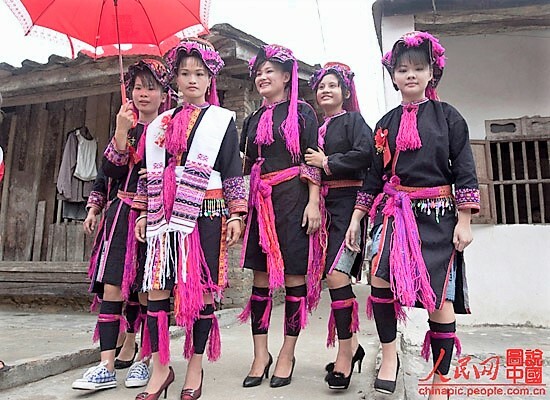 These have also spread over the border into northern Vietnam, in Ha Giang, Lao Cai, and Tuyen Quang, where they are called San Chi. 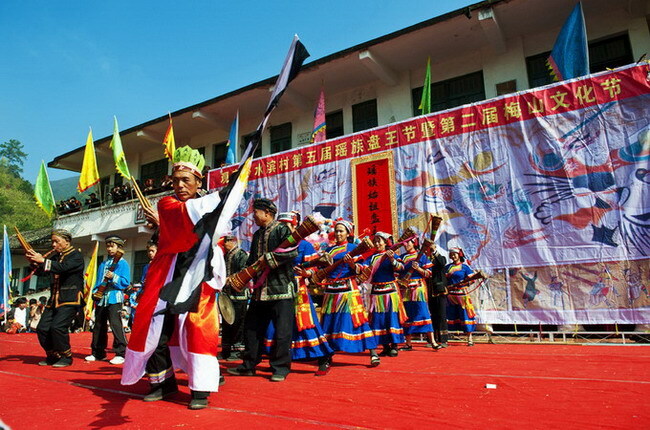 More live in Guangxi, in Napo, Jinxiu, Lipu, Pingle and Bose. 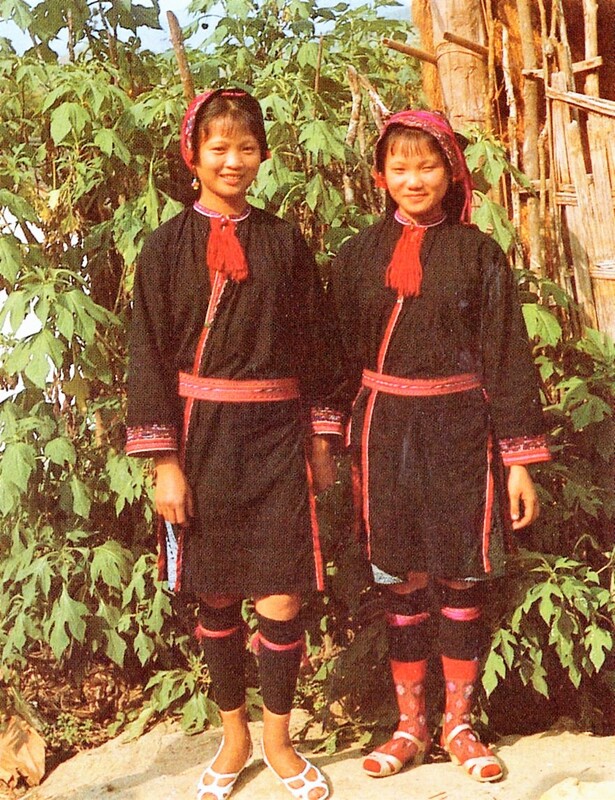 The dress varies slightly in each group. They generally do not wear the celestial crown daily. 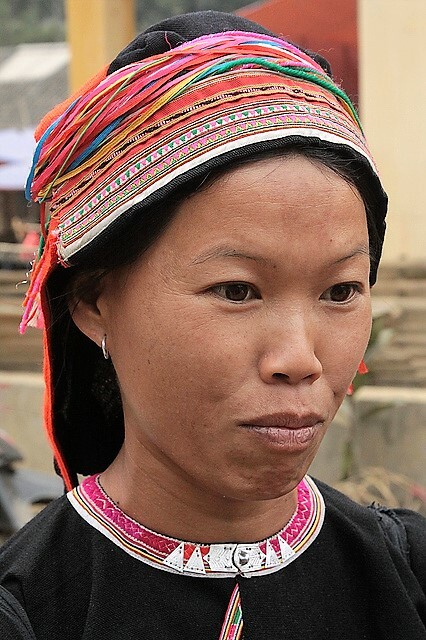 Some wear aluminum or silver triangles on their headscarf. 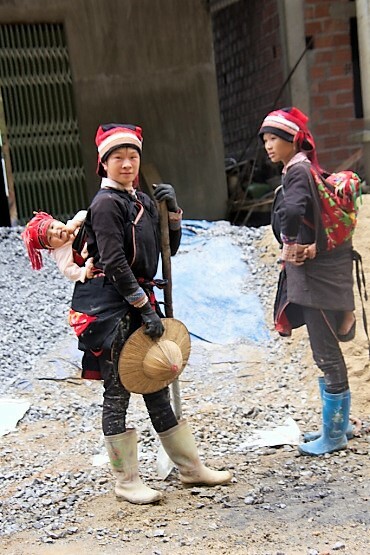 These young women are at work, with shovels and babies. 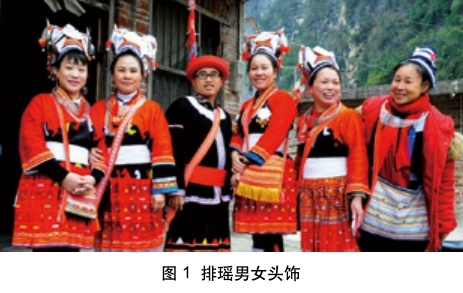 For this dialect, I will present two different groups. 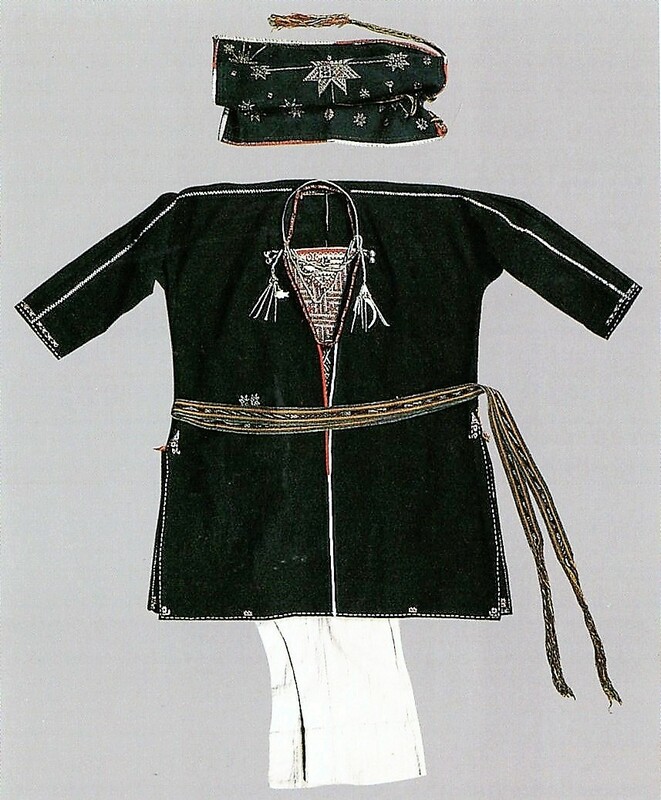 Both of these groups wear a dickey or bib, which covers the front of the torso under the tunic and is richly embroidered. 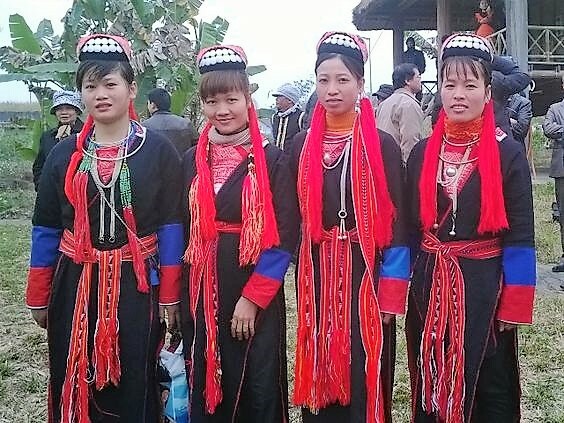 These are some of the various names by which this group is called. 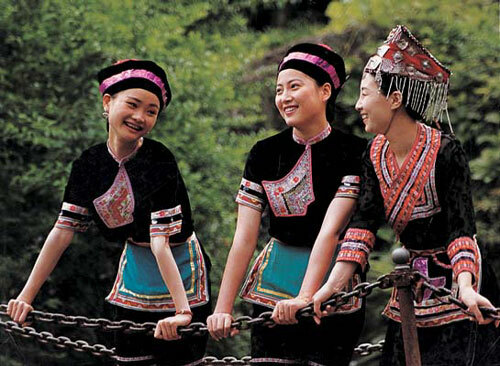 They are found in Yen Bai, Lang Son and Quang Ninh provinces in Vietnam, and also in The Shiwan Dashan mountain area in Southwest Guangxi. 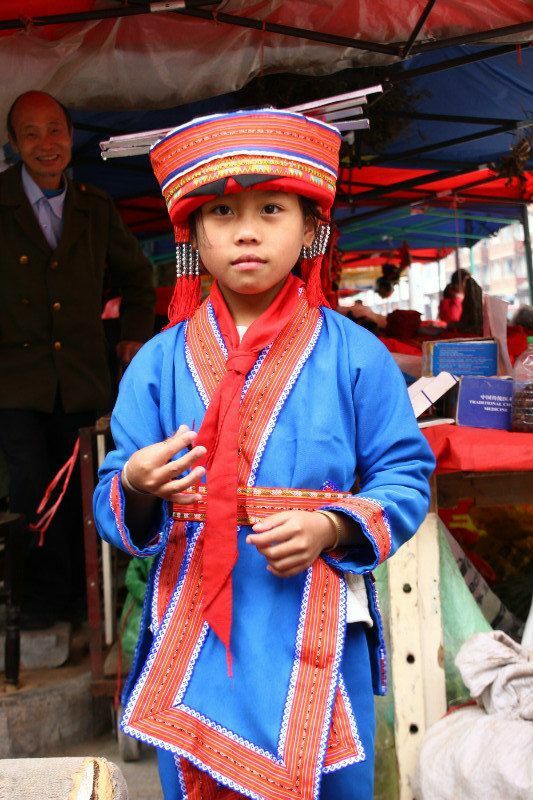 They seem to have arrived in Vietnam from Fangcheng in Guangxi. 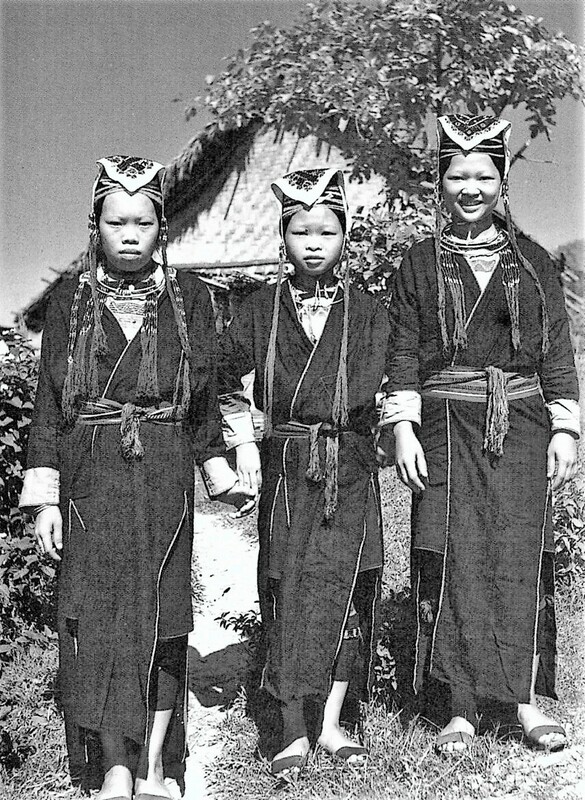 They are not found in Laos or Thailand. 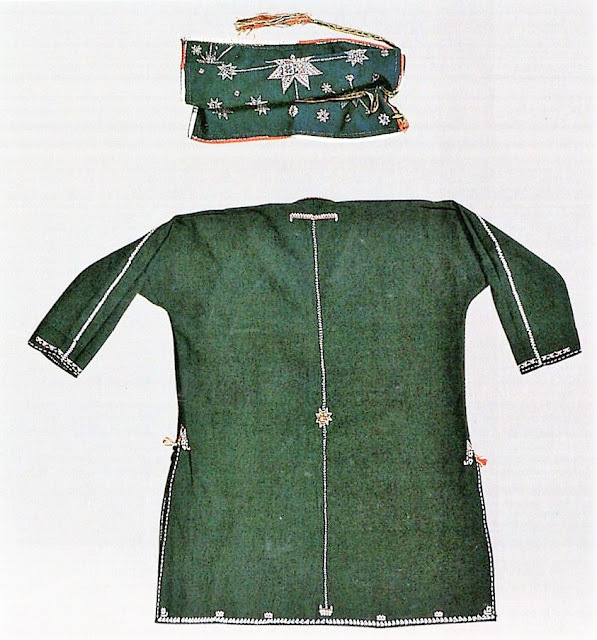 The celestial crown is attached to a cap, the right front panel of the tunic is shorter than the left and always hidden behind it. 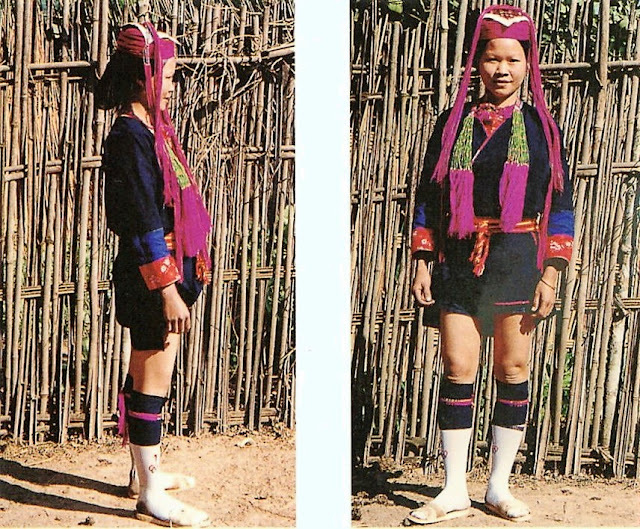 The women wear relatively full pants that come to mid calf, although some groups which live closer to the delta have much shorter pants. Other details also vary by subgroup. 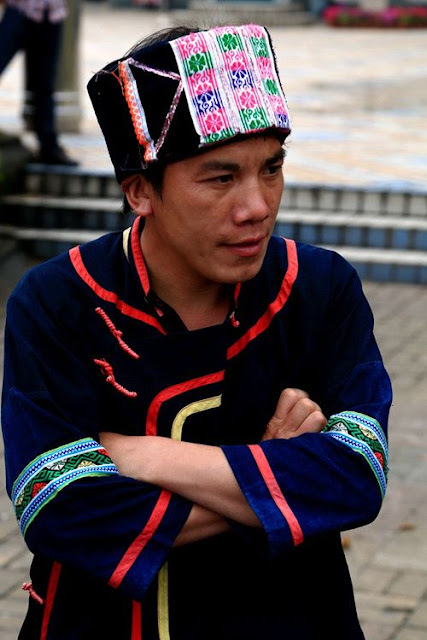 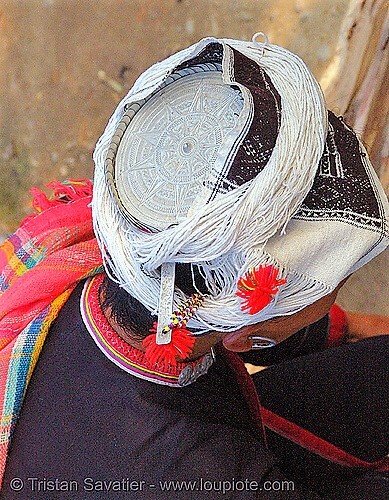 The cap which bears the rayed celestial crown is usually covered with a cloth that has intricate embroidery, which leads to one of their nicknames, Houatou, or flowered, Yao. 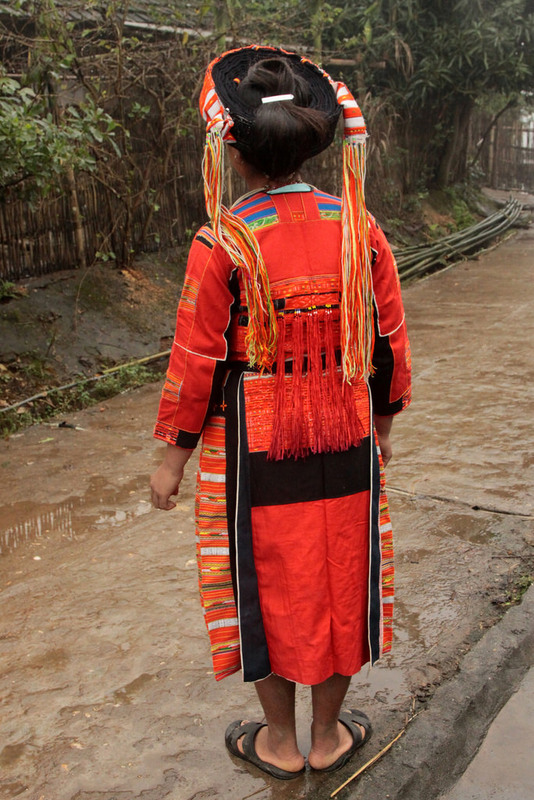 Here are some contemporary photos. 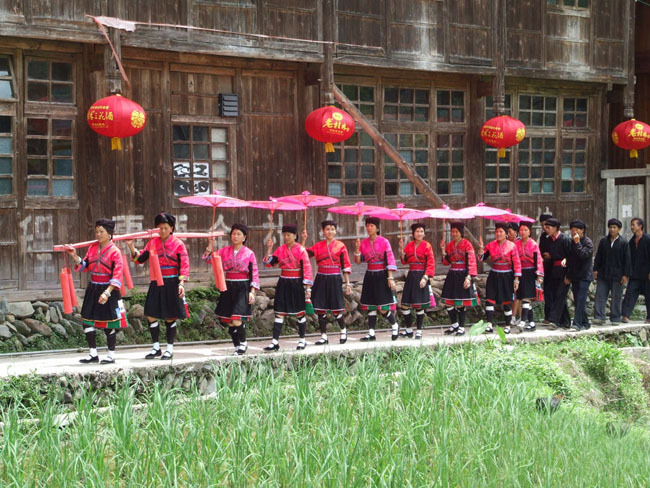 Note that the traditional red unfortunately seems to be shifting to pink.The men have limited but colorful embroider on their shirts. 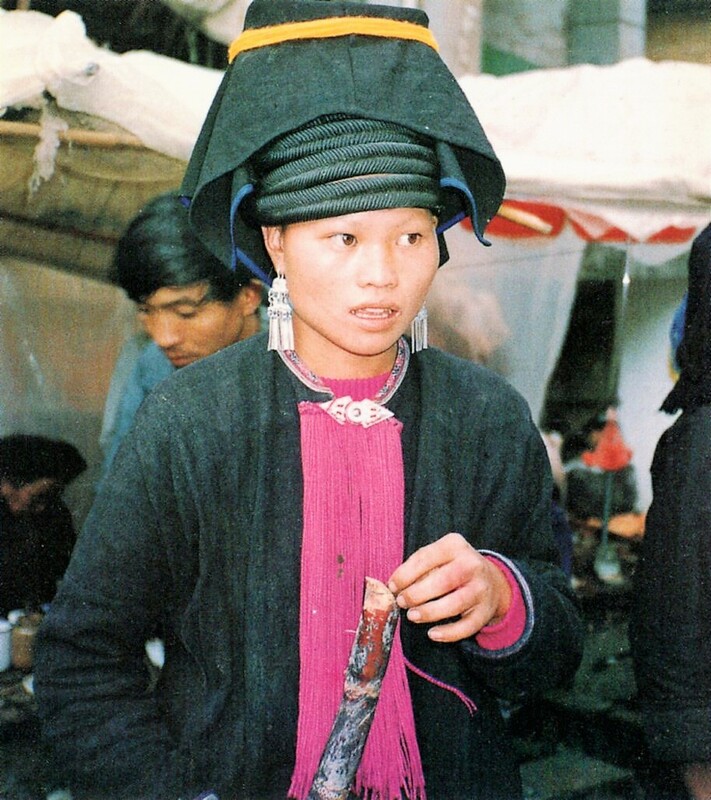 This man is having womens' headscarves pinned to him as part of the wedding ritual. This girl is from Lang Son province, which is almost at sea level and very warm. This group lives between the Red and Lo rivers in Tuyen Quang, Yen Bai, and Lao Cai provinces in Vietnam. 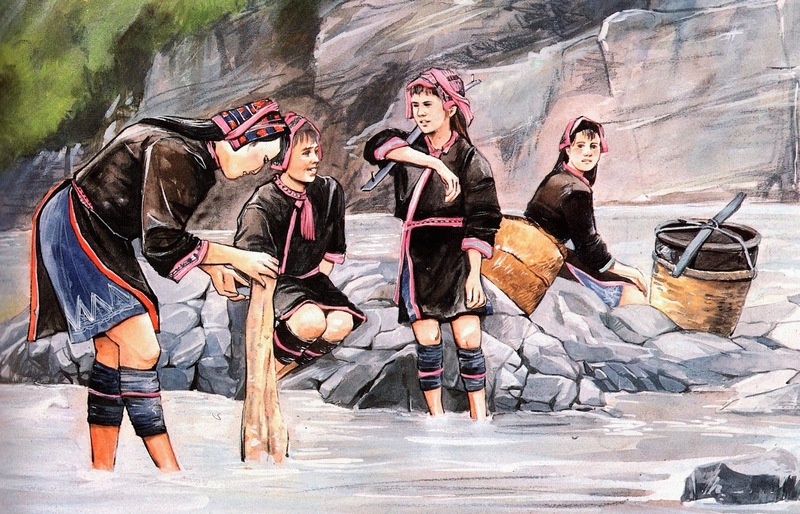 They claim to have arrived a long time ago, and by boat. They are not found outside of Vietnam. 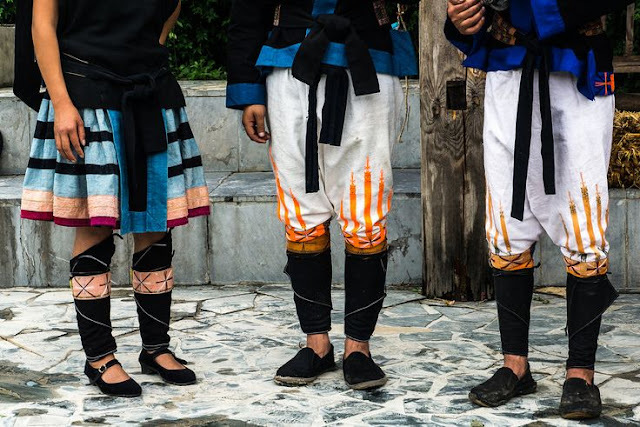 The Vietnamese call them the Quan Trang Dao, which means the 'White Pants Yao', because they wear white pants for special occasions, although the daily pants are indigo, like other Kim Mun. 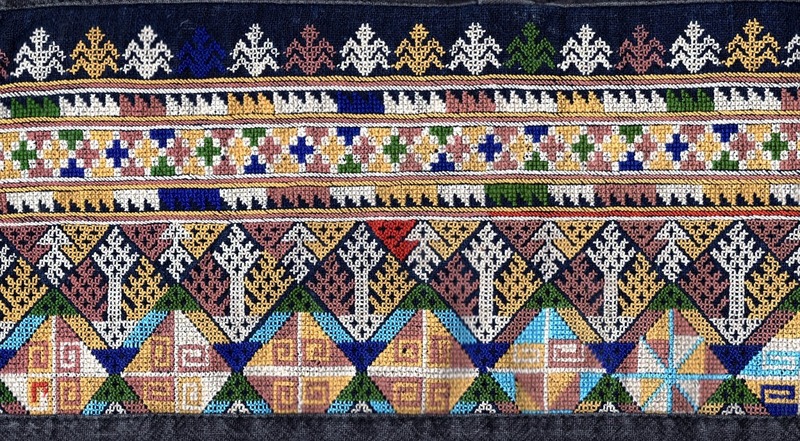 The dickey is extensively embroidered. 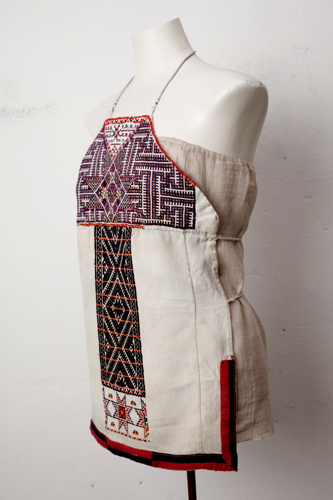 Some shots of everyday wear. 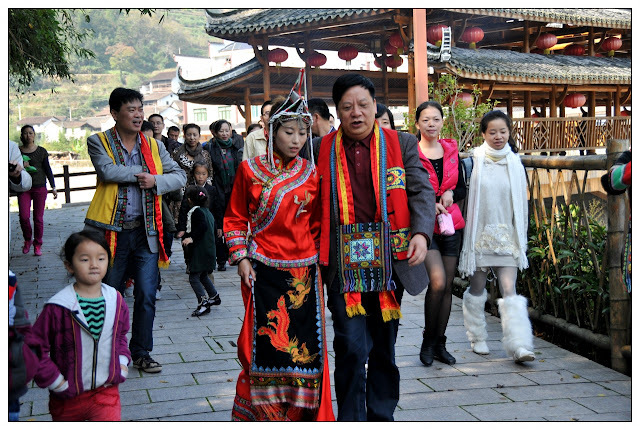 Now some images of festive wear, including scenes from a wedding, in which the women are wearing the white pants, and in this case, so are the men. 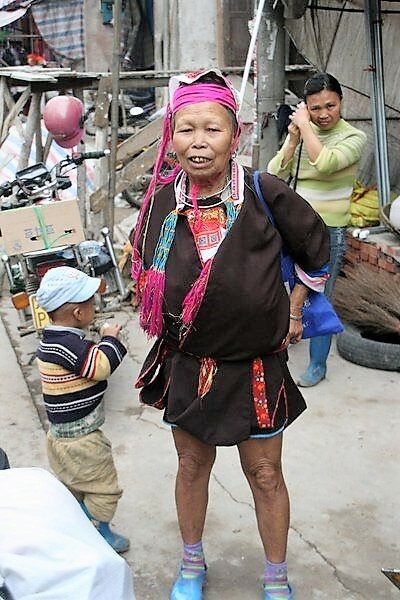 There are about 4,000,000 of these people. 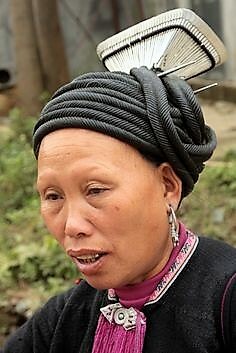 These are the Mien proper. 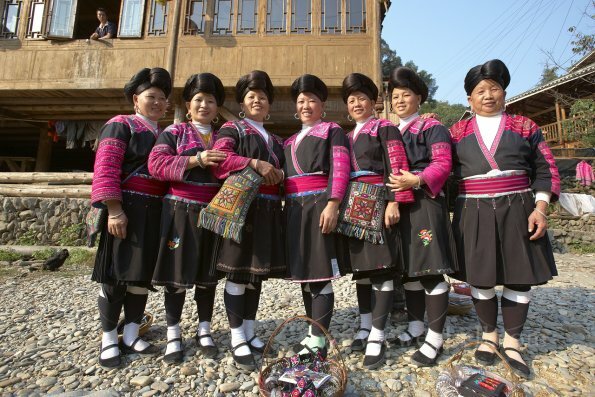 The other groups above do not call themselves Mien. 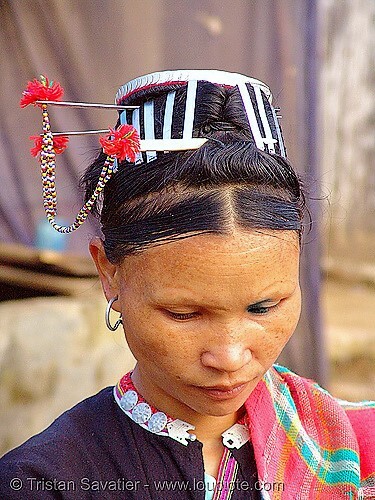 I will cover the Mien in my next article. 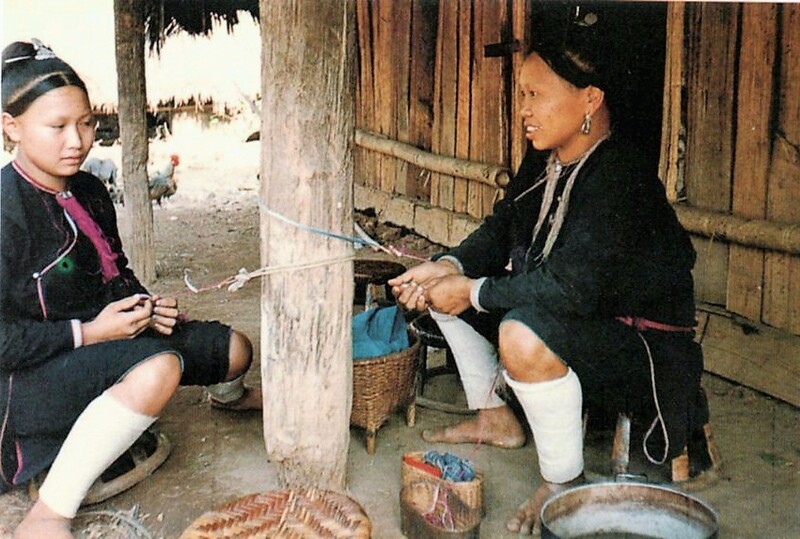 Thank you for reading; I hope that you have found this to be interesting and informative.